Miguel Costansó, an engineer, was one of many soldiers, settlers and missionaries who, on instructions of Fr. Junípero Serra, accompanied Gaspar de Portolá (California governor, 1768-70) on the expedition from San Diego to San Francisco (and back) from July 14, 1769, to Jan. 24, 1770. 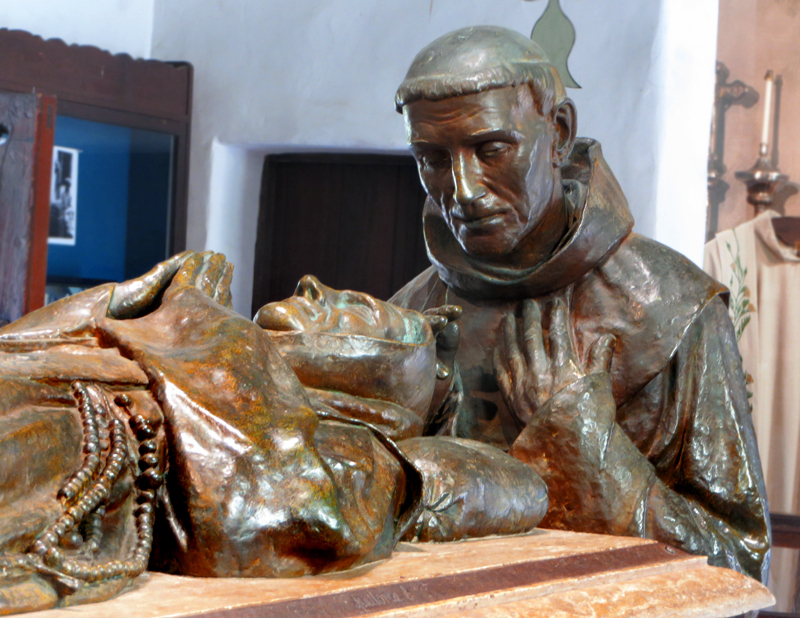 For Serra, a Franciscan padre, the purpose was to find suitable locations for missions; for Portolá, it was to establish a settlement at Monterey Bay. The party overshot Monterey Bay, instead discovering San Francisco Bay, and naming several places (such as Carpinteria and San Luis Obispo) along the way. From Aug. 8 to Aug. 13, the party passed through the Santa Clarita Valley, crossing at Elsmere Canyon on the 8th and camping at Castaic Junction on the 11th before heading down the Santa Clara River Valley toward the Pacific Ocean. On Feb. 7, 1770, while at the Presidio at San Diego, Costansó compiled his notes from the trip into a diary which became the official record of the expedition  ultimately finding its way into the hands of Charles III, King of Spain. Diary of the Journey by Land Made to the North of California by Order of his Excellency the Marques de Croix, Viceroy, Governor and Captain-General of New Spain, Etc., Etc. ; By Instruction of the Most Illustrious Don Joseph De Galvez, of the Council and Court of his Majesty in the Supreme Council of the Indies, Inspector-General of all the Tribunals, Royal Exchequers, and Departments of Finance of his Majesty in the same Kingdom, and Intendant of the King's Army, Etc., Etc. ; Performed by the Troops Detailed for this Purpose under the Command of the Governor of the Peninsula of California, Don Gaspar de Portola, Captain in the Dragones de España Regiment. The departure having been fixed for the 14th of July, the governor ordered out six soldiers and a corporal to explore the country for the distance of the first two days' marches. These soldiers left on the morning of the 12th, and returned on the afternoon of the following day with the information that they had found a watering-place sufficient for the men and horses at a distance of six or seven leagues. After giving water to the animals, as we knew there was none in the place where we were to sleep, we started in the afternoon and proceeded for two leagues. We halted in a canyon, to which we gave the name of San Diego, where there was an abundance of pasture. From San Diego to the canyon of the same name, 2 leagues. Distance from San Diego, 2 leagues. In the morning we broke camp at the place mentioned, and arrived at the spot previously reconnoitered by the scouts; it was given the name of La Poza de Osuna, and also of San Jacome de la Marca  the former by the soldiers, the latter by the missionary fathers. This place is a very picturesque and attractive canyon. In parts it is probably more than two thousand yards wide; it is entirely covered with pasture, with some groves of trees, and has much water collected in pools. Towards the west, and beside one of these, we pitched our camp at one o'clock in the afternoon. On our way we came upon two Indian villages  one about midway, the other in the very canyon where we encamped. All the country through which we passed was rich in pasture and not at all rough. We headed constantly to the northwest and north-northwest as the lay of the land permitted; [the country] was composed of hills of moderate height sloping into various canyons, all of which ran down to the sea, and the waters found their way into them by various creeks in which a quantity of salt accumulates. The Indians of the canyon immediately came to see us; they approached little by little, full of suspicion, and as they were greeted and presented with some strings of glass beads they quieted down and became so familiar with us that they occasioned annoyance. The scouts were sent out during the afternoon, and returned on the following morning with news that they had found a watering-place at a suitable distance. To La Poza de Osuna, 4 leagues. Distance from San Diego, 6 leagues. We broke camp in the afternoon, and, directing our course to the north and north-northwest over high, hilly country like that just covered, we went through two very pleasant canyons. In the first we saw an Indian village [and the inhabitants] came out to receive us as we passed. One of these made a speech and welcomed us, to which we replied only by gestures and signs of appreciation, but without stopping. They accompanied us for a long distance and showed us some small watering-places to one side of the road. We halted in the second canyon near a small Indian village, and close by the watering-place selected. This was a spring of good water situated on the eastern side of the canyon, and as it was somewhat scanty it was necessary to dig a pool in front of it to receive its small supply, and to wait until it filled in order to water the animals. The country was pleasant, covered with undergrowth and some trees called alisos, and exceedingly abundant in pasture. This canyon was given the name of San Alejo. To San Alejo, 3 leagues. From San Diego, 9 leagues. In the afternoon we left the place just mentioned, the country having already been examined by the scouts. We travelled for three leagues. The country was of the same character as that just covered; that is, composed of low hills of black earth, readily traversable and easy of approach, and covered with pasture. We came to the watering-place situated in a moderately wide canyon. The water issued from two different springs and stood in pools, about which it formed some miry places or marshes, covered with reeds and pasture. We pitched our camp upon a slope on the western side of the canyon, and gave the place the name of Santa Sinforosa. From our camp one could see, on the top of a low hill, an Indian village. [The inhabitants,] warned of our coming by their neighbors of San Alejo, sent two of their number to beg leave to come and visit us. We gave them to understand by signs that they should defer the visit until the following day; but forthwith they went back to their village, and in a short time all the inhabitants came [to our camp]  there must have been as many as forty men, well-built and good-looking. The leader or chief soon afterwards began his harangue with loud cries and odd grimaces, but, without giving him time to finish, we made presents to him and his people of some glass beads and sent them away. In the morning they returned and remained quietly amongst us until our departure. To Santa Sinforosa, 2 leagues. From San Diego, 11 leagues. The watering-place found by the scouts was a little more than two leagues from Santa Sinforosa, a distance that we covered in the afternoon. The country over which we passed was also hilly. The place where we halted was exceedingly beautiful and pleasant, a valley remarkable for its size, adorned with groves of trees, and covered with the finest pasture. It must have been nearly a league wide, and different canyons opened into it on the north and northeast. The watering-place consisted of a pool or marsh of considerable extent. We camped on a rising ground within the same valley, towards the west. [To the valley] we gave the name of San Juan Capistrano. The Indians in the neighborhood, warned of our coming, came out to meet us, so confident, it seemed, and certain of our friendship that they brought all their women. The captains or caciques made their usual speeches to us. To San Juan Capistrano, 2 leagues. From San Diego, 13 leagues. We rested at this place, and in the early morning sent out the scouts to reconnoiter the country as far as they could go, but so as to return to camp before nightfall. Seven men with the sergeant of the presidio of the Californias set out for this purpose. The natives came to our quarters very early and in greater number than on the preceding day  there must have been more than two hundred souls of both sexes. They mingled with us with as much familiarity as they could have done with their own countrymen and friends. We greeted them and made them presents, but the novelty made such an impression on them that they did not want to leave us, however much we tried to get rid of them, and they remained until very late watching and observing us. We set out very early in the morning, following one of the canyons that terminated on the northern side of the valley of San Juan Capistrano. This canyon afterwards turned to the northeast, and, for this reason, we left it so as not to go out of our course. After passing some hills, we came into another spacious and pleasant canyon adorned with groves of trees and covered with pasture. The day's journey was two leagues. To this place we gave the name of Santa Margarita. The watering-place was ample; the water, fresh and good, stood in several pools; nevertheless within this same canyon there was a large pond of brackish water. The natives of the near-by villages, numbering about seventy persons of both sexes, immediately came to welcome us; we gave the women some glass beads and sent them away. To Santa Margarita, 2 leagues. From San Diego, 15 leagues. We broke camp in the morning, and, taking the course to the northwest, we left the canyon of Santa Margarita. The road was over low hills, and after [travelling] for two leagues, we halted on the western side of the canyon. The watering-place consisted of some pools, and there was sufficient pasture. In this place we saw some native women, but very few Indians could be seen. We gave it the name of Cañada de los Rosales, on account of the great number of rose bushes we saw. To Los Rosales, 2 leagues. From San Diego, 17 leagues. We left Los Rosales, and, following the course to the northwest over a road of low hills and gullies, we arrived at the watering-place, distant about three leagues from our starting point. The water was held in a pool of small size but of considerable depth, in a canyon on the eastern side of which we pitched our camp on level ground covered with pasture. Near the camp there was a small Indian village; the people remained with us, very happy and contented, during the greater part of the day. At this place the missionary fathers baptized two children of these natives that were dying, for which reason we gave the place the name of the Cañada del Bautismo. To the Cañada del Bautismo, 3 leagues. From San Diego, 20 leagues. From the Cañada del Bautismo we came to another canyon, to which we gave the name of Santa María Magdalena, situated to the north-northwest of the first. The road, although over hilly country and somewhat broken ground, was not very laborious. The place had abundant pasture, and was thickly covered with willows and other trees. The watering-place was very copious  the water held in pools among reeds and rushes. To Santa María Magdalena, 3 leagues. From San Diego, 23 leagues. We set out, and, taking the course to the north-northwest through another canyon that opens into that of Santa María Magdalena, we turned to the west and reached the top of some low hills. Afterwards, crossing a considerable stretch of level country, we entered another canyon, very picturesque, which ran at the foot of a high range, containing a stream of water and many trees. We pitched our camp to the east on level ground. Immediately, there came to visit us the Indians who inhabited a village within the same canyon. They came unarmed and showed unequalled affability and gentleness. They made us gifts of their humble seeds, and we presented them with ribbons and trifles. To San Francisco Solano, 3 leagues. From San Diego, 26 leagues. We rested in the canyon described, which we called the Cañada de San Francisco Solano. Early in the morning the scouts set out to examine the country; they returned in the afternoon with news of having found a watering-place, but at a distance of six leagues or over. We left San Francisco Solano after midday, having taken the precaution to water the animals. We directed our course to the northwest, over mounds of earth, moderately high and passable, until we descended to a very extensive plain, of which the limit could not be discerned by the eye. After three leagues we halted close to a very small watering-place; it was scarcely sufficient for the people. We called it the Aguage del Padre Gómez as it was discovered by this missionary father who was of our company. To the Aguage del Padre Gómez, 3 leagues. From San Diego, 29 leagues. In the morning we broke camp at the watering-place above mentioned, and, crossing the plain in the direction of the northwest, we arrived, after three leagues, at the watering-place, which was a stream of very good running water. One could see, however, that it was diminishing each day on account of the dry season, the water gradually sinking into the sand. The stream descended from the range, and appeared to have a considerable flow in the rainy season. Its banks are very luxuriant. To this place we gave the name of Santiago. To Santiago, 3 leagues. From San Diego, 32 leagues. From Santiago we went to another place of which the scouts gave us particulars. It was not far, in truth, as we arrived after an hour's march. It is a beautiful river, and carries great floods in the rainy season, as is apparent from its bed and the sand along its banks. This place has many groves of willows and very good soil, all of which can be irrigated for a great distance. We pitched our camp on the left bank of the river. To the right there is a populous Indian village; the inhabitants received us with great kindness. Fifty-two of them came to our quarters, and their captain or cacique asked us by signs which we understood easily, accompanied by many entreaties, to remain there and live with them. [He said] that they would provide antelopes, hares, or seeds for our subsistence, that the lands which we saw were theirs, and that they would share them with us. At this place we experienced a terrible earthquake, which was repeated four times during the day. The first vibration or shock occurred at one o'clock in the afternoon, and was the most violent; the last took place at about half-past four. One of the natives who, no doubt, held the office of priest among them, was at that time in the camp. Bewildered, no less than we, by the event, he began, with horrible cries and great manifestations of terror, to entreat the heavens, turning in all directions, and acting as though he would exorcise the elements(?). To this place we gave the name of Río de los Temblores. To the Río de los Temblores, 1 league. From San Diego, 33 leagues. At two o'clock in the afternoon, we started from the Río de los Temblores. We travelled for two leagues, leaving the level country and the coast to enter the mountains, as we feared a lack of water in the plain. We found no water for the animals, but there was sufficient for the people in some little springs or small pools in a narrow canyon close to a native village. The Indians of this village were holding a feast and dance, to which they had invited their neighbors of the Río de los Temblores. To Los Ojitos, 2 leagues. From San Diego, 35 leagues. We left Los Ojitos, where there was another earthquake of no great violence, at half-past six in the morning. We crossed the plain in a northerly direction, steadily approaching the mountains. We ascended some hills which were quite rugged and high; afterwards we descended to a very extensive and pleasant valley where there was an abundance of water, part of it running in deep ditches, part of it standing so as to form marshes. This valley must be nearly three leagues in width and very much more in length. We pitched our camp near a ditch of running water, its banks covered with watercress and cumin. We gave this place the name of Valle de San Miguel. It is, perhaps, about four leagues from Los Ojitos. In the afternoon we felt another earthquake. To the Valle de San Miguel, 4 leagues. From San Diego, 39 leagues. We left this camping-place at seven o'clock in the morning, and, crossing the ditch over which we had to lay a bridge on account of the depth, we travelled for two leagues to the west-northwest through fields of dry grass and thickets, which detained us for a long time as it was necessary to clear a path at every step. We crossed a very muddy stream and camped farther on in an open clear spot in the same valley, and close to a gap which was seen to the west. At half-past eight in the morning we experienced another violent earthquake. Through the same Valle de San Miguel, 2 leagues. From San Diego, 41 leagues. We rested to-day, and the scouts went out to explore the country. At ten o'clock in the morning there was an earthquake, which was repeated with violence at one o'clock in the afternoon; and one hour afterwards we experienced another shock. Some of the soldiers asked permission to go hunting mounted on their horses and others [to go] on foot, with the intention of killing some antelopes, as many of these animals had been seen. They are a species of wild goat with horns somewhat larger than those of the goats. These soldiers, on their return, said that they had seen a river of fine water  from sixteen to seventeen yards wide  that rises near the gap of the valley to the south, and at the foot of a low hill that was in sight of our camp, and, at the most, half a league distant. In the morning we broke camp, and travelling towards the west, we left the valley by an opening formed between low hills. Later we entered quite an extensive canyon containing many poplars and alders, among which a beautiful river flowed towards the north-northwest, and turning the point of a small steep hill it afterwards continued its course to the south. To the north-northeast one could see another water-course or river-bed which formed a wide ravine, but it was dry. This water-course joined that of the river, and gave clear indications of heavy floods during the rainy season, as it had many branches of trees and debris on its sides. We halted at this place, which was named La Porciúncula. Here we felt three successive earthquakes during the afternoon and night. To the Río de la Porciúncula, 2 leagues. From San Diego, 43 leagues. We forded the Río de la Porciúncula, which descends with great rapidity from the canyon through which it leaves the mountains and enters the plain. We directed our course to the west-southwest over high level ground and, after a march of three leagues, we reached the watering-place, to which we gave the name of the Ojo de Agua de los Alisos. This was a large spring situated in a marshy place where there stood some alder trees of very large girth; the marsh was covered with grass, fragrant plants, and watercress. Hence the water flowed through a deep ditch towards the southwest. All the country that we saw on this day's march appeared to us most suitable for the production of all kinds of grain and fruits. On our way we met the entire population of an Indian village engaged in harvesting seeds on the plain. In the afternoon there were other earthquakes; the frequency of them amazed us. Someone was convinced that there were large volcanoes in the mountain range that lay in front of us extending towards the west. We found sufficient indications of this on the road that lies between the Río de la Porciúncula and the Ojo de Agua de los Alisos, as the scouts saw, adjoining the mountains, some large swamps of a certain material like pitch which was bubbling up. To the Ojo de Agua de los Alisos, 3 leagues, From San Diego, 46 leagues. From the Ojo de Agua de los Alisos, skirting the mountains, over a good level road covered with grass, we reached the Ojos de Agua del Berrendo, a name we gave the place because we caught there one of these animals alive  its leg had been broken on the preceding afternoon by a musket-shot from a volunteer soldier who had not been able to overtake it. The watering-place was situated in a hollow surrounded by low hills near the seacoast. Here we found an Indian village [and the inhabitants were] very good-natured. They came at once to our quarters with trays of seeds, nuts, and acorns; to these presents we responded with our strings of glass beads, which they hold in high esteem. To the Ojo de Agua del Berrendo, 2 leagues. From San Diego, 48 leagues. The scouts who had set out to examine the coast and the road along the beach returned shortly afterwards with the news of having reached a high, steep cliff, terminating in the sea where the mountains end, absolutely cutting off the passage along the shore. This forced us to seek a way through the mountains, and we found it, although it was rough and difficult. We then set out from the Ojos del Berrendo in the afternoon, and, directing our course to the northwest towards the point where there appeared to be an opening in the range, we entered the mountains through a canyon formed by steep hills on both sides. At the end of the canyon, however, the hills were somewhat more accessible and permitted us to take the slope and, with much labor, to ascend to the summit, whence we discerned a very large and pleasant valley. We descended to it and halted near the watering-place, which consisted of a very large pool. Near this there was a populous Indian village, [and the inhabitants were] very good-natured and peaceful. They offered us their seeds in trays or baskets of rushes, and came to the camp in such numbers that, had they been armed, they might have caused us apprehension, as we counted as many as two hundred and five, including men, women, and children. All of them offered us something to eat, and we, in turn, gave them our glass beads and ribbons. We made three leagues on this day's journey. To the valley we gave the name of Santa Catalina; it is about three leagues in width and more than eight in length, and is entirely surrounded by hills. To the Valle de Santa Catalina, or Valle de los Encinos, 3 leagues. From San Diego, 51 leagues. We rested to-day, and received innumerable visits from natives who came from various parts to see us. They had information of the appearance of the packets on the coast of the Canal de Santa Bárbara. They drew on the ground the outline or map of the channel and its islands, tracing the course of our ships. They also told us that, in former times, there had come to their country bearded people, dressed and armed like ourselves, indicating that they had come from the east. One of the natives related that he had been as far as their lands, and had seen places or towns composed of large houses, and that each family occupied one of its own. He added further, that at the distance of a few days' marches  about seven or eight  to the north we would arrive at a large river which flowed between rugged mountains and could not be forded; and that farther on we would see the ocean which would hinder us from continuing our journey in that direction. However, we left the verification of the information of these geographers to the test of our own eyes. We crossed the Valle de Santa Catalina, which is nearly three leagues wide, and pitched our camp at the foot of the mountains that we had to enter on the following day. There was, among rushes and reeds, more than enough water for the people, but very little for the animals. Through the same Valle de los Encinos, 3 leagues. From San Diego, 54 leagues. We entered the mountain range, the road having been already marked out by the pioneers who had been sent ahead very early in the morning. Part of the way we traveled through a narrow canyon, and part over very high hills of barren soil, the ascent and descent of which were exceedingly difficult for the animals. We descended afterwards to a little valley where there was an Indian village; the inhabitants had sent us messengers to the Valle de Santa Catalina, and guides to show us the best trail and pass through the range. These poor fellows had prepared refreshments for our reception, and, as they saw that it was our intention to move on so as not to interrupt the day's march, they made the most earnest entreaties to induce us to visit their village, which was off the road. We had to comply with their requests so as not to disappoint them. We enjoyed their hospitality and bounty, which consisted of seeds, acorns, and nuts. Furthermore, they furnished us other guides to take us to the watering-place about which they gave us information. We reached it quite late. The day's march was four leagues. The country from the village to the watering-place is pleasing and picturesque on the plain, although the surrounding mountains are bare and rugged. On the plain we saw many groves of poplars and white oaks, which were very tall and large. The watering-place consisted of a stream, containing much water, that flowed in a moderately wide canyon where there were many willows and poplars. Near the place in which we camped there was a populous Indian village; the inhabitants lived without other protection than a light shelter of branches in the form of an inclosure; for this reason the soldiers gave to the whole place the name of the Ranchería del Corral. To the Ranchería del Corral, 4 leagues. From San Diego, 58 leagues. Before our eyes extended vast mountain chains which we had necessarily to enter if we wished to continue our course to the north or northwest, as these were the directions most advantageous and most convenient for our journey. We feared that the more we penetrated into the country the greater the difficulties might be, and that we might be led very far from the coast. It was decided, therefore, to follow the canyon in which we had camped, and the course of the stream, if possible, as far as the sea. To this purpose the scouts, who had been sent out early in the morning, had orders to proceed as far as they could, and to find out if there were any obstacles on the road. For this reason the people and animals rested to-day. A multitude of Indians came to the camp with presents of seeds, acorns, and honeycombs formed on frames of cane. They were a very good-natured and affectionate people. They expressed themselves admirably by signs, and understood all that we said to them in the same manner. Thus they gave us to understand that the road inland was very mountainous and rough, while that along the coast was level and easy of access; that if we went through the interior of the country we would have to pass over five mountain ranges, and as many valleys, and that on descending the last range we would have to cross a full and rapid river that flowed between steep banks. During the night the scouts returned and reported that the land which led to the coast was level and contained plenty of water and pasture; they had not been able to see the ocean, although they had travelled for about six leagues following the course of the canyon. We travelled for three leagues through the canyon which still ran in the same direction  west-southwest. We halted on the bank of the stream which, at the time of our arrival, flowed with considerable volume, but, shortly after, dried up with the heat of the sun  just as the scouts told us they had noticed on the previous day. This peculiarity we afterwards observed in other streams; they flowed by night and became dry by day. All the soil of this canyon is very boggy, treacherous, and of a whitish color; the animals sank into it at every step. This canyon was given the name of Santa Clara. Through the Cañada de Santa Clara, 3 leagues. From San Diego, 61 leagues. We set out very early in the morning; the canyon still ran in the same direction  west-southwest. After three leagues we halted near a populous village situated on another stream of running water. This emerges from the range through a narrow gorge and empties into the Cañada de Santa Clara, which at this point has a greater width. This village must contain over two hundred souls, who live with no better protection than the Indians of the [Ranchería del] Corral, that is to say, within a similar inclosure of branches. In the afternoon, seven chiefs or caciques came with a large following of Indians armed with bows and arrows, but with the bowstrings loosened in sign of peace. They brought generous presents of seeds, acorns, nuts, and pine-nuts, which they spread out before us. The chiefs inquired who was in command of us, and offered to the commander and his officers, as a mark of distinction, various necklaces of some little black and white stones; in hardness and substance they greatly resemble coral, and only differ from it in color. To-day we have probably seen more than five hundred Indians. Through the Cañada de Santa Clara, 3 leagues. From San Diego, 64 leagues. In the afternoon, we broke camp and steadily followed the canyon over a road broken by streams and gullies formed by the watershed of the mountain range which is drained by them during the rainy season. We halted on the bank of one of them which still carried a considerable amount of water. We covered three leagues on this day's march. Some natives from a village within sight came with their trays of seeds and pine-nuts; these they offered us with the same liberality and willingness as the others. Through the Cañada de Santa Clara, 3 leagues. From San Diego, 67 leagues. We marched for two leagues, steadily descending the canyon with the intention of reaching the coast which we presumed to be already near. We pitched our camp at a short distance from the stream  henceforth we shall call it, with greater propriety, a river, on account of its volume at this place, increased by various streams which empty into it on both sides of the canyon. From this place we observed a spacious plain, covered with grass and with some trees, extending to the south and west as far as the sea. Near our camp there was a very small Indian village; the inhabitants lived in huts thatched with grass, of a spherical form like the half of an orange, each having a vent in its upper part through which the light entered and the smoke escaped. Through the Cañada de Santa Clara, 2 leagues. From San Diego, 69 leagues. We broke camp in the morning, directing our course to the west-southwest for a distance of two leagues. We reached the coast, and came in sight of a real town  the most populous and best arranged of all we had seen up to that time  situated on a tongue or point of land, right on the shore which it was dominating, and it seemed to command the waters. We counted as many as thirty large and capacious houses, spherical in form, well built, and thatched with grass. We judged from the large number of people that came out to meet us, and afterwards flocked to the camp, that there could not be less than four hundred souls in the town. These natives are well built and of a good disposition, very agile and alert, diligent and skillful. Their handiness and ability were at their best in the construction of their canoes made of good pine boards, well joined and calked, and of a pleasing form. They handle these with equal skill, and three or four men go out to sea in them to fish, as they will hold eight or ten men. They use long double-bladed paddles and row with indescribable agility and swiftness. All their work is neat and well finished, but what is most worthy of surprise is that to work the wood and stone they have no other tools than those made of flint; they are ignorant of the use of iron and steel, or know very little of the great utility of these materials, for we saw among them some pieces of knives and sword-blades which they used for no other purpose than to cut meat or open the fish caught in the sea. We saw, and obtained in exchange for strings of glass beads and other trinkets, some baskets or trays made of reeds, with different designs; wooden plates and bowls of different forms and sizes, made of one piece so that not even those turned out in a lathe could be more successful. They presented us with a quantity of fish, particularly the kind known as bonito (this was the season to catch it, judging from the ease with which they took it); it had as good a taste and as delicate a flavor as that caught in the tunny-fisheries of Cartagena de Levante and on the coasts of Granada. We thought that this was the town which the first Spanish navigators  among others Rodríguez Cabrillo  named Pueblo de Canoas. We gave it the name of La Asunción de Nuestra Señora, or La Asumpta, because we reached it on the eve of that festival. We pitched our camp at a short distance from the town on the banks of a river which comes through a narrow gorge from the mountains to the north and carries its waters to the sea. In the afternoon, some of the caciques or chiefs from the mountains came with their people to welcome us. Different islanders of the Canal de Santa Bárbara, who happened to be in the Pueblo de la Asumpta, also came to visit us. To the Pueblo de la Asumpta, 2 leagues. From San Diego, 71 leagues. In the afternoon we set out after watering the animals, because the scouts informed us that we could not reach the watering-place (as it was a considerable distance from the place we left) in a single march. We travelled for two leagues along the beach, and pitched our camp near a temporary village of Indian fishermen, who gave us more fish than we could eat. During the night, these people serenaded us with pipes or whistles; these were very disagreeable and only served to annoy us and keep us awake. To the Ranchería Volante, 2 leagues. From San Diego, 73 leagues. In the morning we marched for another two leagues, or a little more, steadily following the coast. We arrived at an Indian village or rather a populous native town, situated right on the shore on a point of land near which ran a small stream of good water. The natives of this village immediately came to the camp  this we placed on the opposite side of the stream  bringing fish, roasted or grilled in barbecue, for us to eat while their canoes, then out fishing, were returning with fresh fish. These canoes landed on the beach shortly afterwards, and brought an abundance of bonito and bass, which they gave us and offered in such quantity that we might have loaded the pack-animals with fish if we had had the facilities to salt and prepare it. Moreover, they gave us fish dried without salt (this they not use in their victuals) which we took as a precaution, and it was of great service to us on the journey. One of the chiefs or caciques of this town was in La Asumpta when we passed through that place, and was one of those who took the greatest care to please us. He was a robust man, of good figure and countenance, and a great dancer, and for this reason we gave his town the name of El Bailarín. It seemed to us still more populous than La Asumpta, and the houses are of the same structure and appearance. To the Pueblo del Bailarín, 2 leagues. From San Diego, 75 leagues. We continued our march along the margin of the beach for a short distance, and afterwards over high hills on the coast. We halted about a quarter of a league inland, near a small stream of excellent water which flowed from a canyon of the range; [here there were] many willows. We saw before us another village or Indian town composed of thirty-two houses, and as populous as the previous ones. Men, women, and children came to the camp bringing fish both fresh and roasted, eager to obtain glass beads and trinkets, which are the best money and more highly valued among them than gold and silver. The soldiers called this town Pueblo de la Carpintería, because at this time [the natives] were constructing a canoe. It is only one league from the Pueblo del Bailarín. This place seemed to all [of us] very suitable for a mission, on account of the innumerable heathen that inhabit these shores within a radius of only six leagues, and because it has extensive lands well adapted for cultivation and capable of producing rich crops. We may say the same in a mystical sense, as the gentleness of this people gave us great hopes that the word of God will fructify equally in their hearts. To La Carpintería, 1 league. From San Diego, 76 leagues. From the Pueblo de la Carpintería we marched to the Pueblo de la Laguna, distant three leagues from the first. We pitched our camp close to a pond of fresh water, from which the natives that occupy [the land] and live in the vicinity, take their supply. This was the most populous of all the towns that we, so far, had seen; we estimated that it might contain more than six hundred souls. They offered us as much fish, roasted and fresh, as we could desire, and came to the camp with their women and children; in no other place had we met natives so affectionate and good-natured. On our way we found two ruined villages; we could not ascertain why they were so, but we concluded that it might be the effect of the wars and quarrels that arise very easily among the natives. To the Pueblo de la Laguna, 3 leagues. From San Diego, 79 leagues. We broke camp rather to get away from the annoyance of the natives than to make a day's march; and so, as soon as we made half a league, turning from the shore  at this place steep and fringed by high hills  we halted in a canyon that had running water, although it sank into the sand not far from its source. The canyon was covered with beautiful live-oaks and poplars, and pines grew on the hill-tops. The scouts, who had been sent out in the morning, came back in the afternoon with the news that they had seen large towns and many natives, telling everyone of the welcome that had been given them on all sides. At night ten unarmed natives came to the camp with the object, they said, of guiding us to their village in the morning. We allowed them to pass the remainder of the night at some distance from the camp, and sent them some [of our men] who kept them company, and entertained them until daybreak. From this canyon we went to the Pueblos de la Isla, distant some three leagues from La Laguna, over a road on level ground between the range and some low hills that lay along the coast. We came in sight of a long, bare point of land; on the eastern side of it a large estuary enters through two different mouths (as some said, because all the men did not see both), half a league, more or less, distant from each other. The estuary surrounds a small hill and a tongue of land of moderate length  this was affirmed to be an island by those who declared that they had seen the two mouths of the estuary, and it must have been so if there were two mouths. On this hill, whose verdure and trees gave very great pleasure to the eye, there stood a very populous Indian town containing innumerable houses, so that someone asserted that he had counted more than one hundred. The estuary spreads over the level country towards the east, forming marshes and creeks of considerable extent, and on their banks there are two other towns, less populous than the Pueblo de la Isla. We passed through one of them to reach the watering-place, near which we pitched our camp. After a short time, the natives of the three towns came with roasted and fresh fish, seeds, acorns, atole or gachas, and various other foods, earnestly inviting us to eat, and showing in their faces the pleasure that our presence gave them. We treated them all kindly, and gave them glass beads, ribbons, and other trifles, in exchange for which we received various curios, such as baskets, furs, and plumes. All the land that we examined, along the road as well as from our camp, is exceedingly pleasing, with an abundance of pasture, and covered with live-oaks, willows, and other trees, giving indications of fertility and of [a capacity] to produce whatever one might desire to sow. The natives, not content with making us presents of their eatables, wished, furthermore, to give us a feast, thus manifesting the mutual rivalry and contention between the towns to excel each other in gifts and festivities, in order to merit our approval and praise. In the afternoon the leaders and caciques of each town came, one after the other, adorned according to their custom  painted and decked with feathers, having in their hands some split canes with the motion and noise of which they marked time for their songs, and the rhythm for the dance, so regularly and so uniformly that there was no discord. The dancing continued all the afternoon, and we had hard work to rid ourselves of [our visitors]. Finally we sent them away, earnestly recommending them, by means of signs, not to come back during the night to disturb us; but in vain. At nightfall they returned with a large retinue of clowns or jugglers, playing whistles, the noise of which grated upon the ears. It was to be feared that they would stampede our horses, and, for this reason, the commander, with his officers and some soldiers, went out to receive them. These gave the natives some glass beads, and intimated to them that if they came back to disturb our sleep, they would no longer be our friends and we would give them a bad reception. This was a sufficient measure to cause them to retire and to leave us in peace for the remainder of the night. To the Pueblos de la Isla, 3 leagues. From San Diego, 82 leagues. From the Pueblo de la Asumpta this coast extends, with slight variation, to the west-northwest, as far as the town we left this morning  called Pueblo de la Laguna, as has already been said. From this point the coast extends almost due west, in which direction we marched for two leagues over high hills in sight of the ocean. These hills were intersected by some gullies made by the drainage from the range which in some places nearly reaches the beach, leaving little land in the intervening space; while in other places the mountains recede and leave some level ground  half a league or a little more  between them and the sea. We passed through quite a large grove of live-oaks, and arrived at the watering-place, a stream of good water in a canyon, on whose sides, and near the shore, there stood an Indian village which must have contained more than a thousand souls. We halted to the right of the canyon, not far from the village. The inhabitants soon came to welcome us; they also gave us much fish, both fresh and dried, the latter preserved without salt. They did not spare us the compliment of the dance and festivity, which were like those of La Isla. This place received the name of San Luis Obispo. To San Luis Obispo, 2 leagues. From San Diego, 84 leagues. The scouts, who had set out early in the morning, returned at one o'clock in the afternoon with news of having found water, and a good road along the beach at low tide. To avail ourselves of this circumstance it was necessary to defer the march until the following morning; the people and animals, therefore, rested at this place. In the morning, taking advantage of the low tide, we travelled about a league along the beach. Then we left it and made the rest of the march  which was of three leagues  over high hills. In some places these hills terminated in the sea, and were frequently intersected by ravines and gullies  nearly all with running water  through which the mountain range is drained. We arrived at the stopping-place, which was a town of eighty houses and about eight hundred souls. It was situated on both sides of a canyon that had running water. [The natives] also complimented us with a dance and abundant gifts of fish and seeds. We pitched our camp on the left bank of the stream, on a high open spot. We gave the name of San Guido to the entire place. To San Guido, 3 leagues. From San Diego, 87 leagues. To-day's march was as difficult as that of yesterday, the road and country being of the same character. It was frequently found necessary to send the pioneers ahead to put the bad places in order; this toilsome drudgery caused us much delay on the march. We came to the stopping-place, a canyon into which an estuary of salt-water entered; upon its sides there is an Indian town of fifty hearths where we were received and entertained as in the previous ones. These natives have a scarcity of fire-wood, and as for water, to obtain it good they have to get it up the canyon before the waters of the stream that comes down through this unite with those of the estuary. From this place, which we named San Luis Rey, we discovered, in the afternoon, the three last islands of the Canal de Santa Bárbara. These are San Bernardo, the most westerly; then Santa Cruz, to the east; and Santa Bárbara, the most easterly of the three, which gave its name to the stretch of sea and coast about which we are speaking. To-day we made three leagues. To San Luis Rey, 3 leagues. From San Diego, 90 leagues. We set out from the Pueblo de San Luis and occupied four hours in making two leagues over high, and very broken land along the shore. One of the ravines entirely obstructed the way because of the ruggedness of its western slope. We decided to take the road along the beach, over the stones, at the foot of a cliff washed by the ocean waves  a road equally impassable except at low tide. This cliff extended for a quarter of a league, and, afterwards, we crossed high hills to the place named San Zeferino Papa. It was an Indian town of twenty-four houses, and two hundred souls, more or less. They received us with affability and kindness. Their situation is rather desolate; they live in a canyon surrounded by hills of no great height, entirely barren, and destitute of trees. In the interior of the country there are other similar hills, equally desolate in appearance, but they are not without pasture, and the land has good soil. An estuary enters the mouth of the canyon and serves as a landing-place for the Indians, who live by fishing, as do all the others on these coasts. There is fresh running water in this canyon, but one must procure it upstream before it mingles with that of the estuary. At this place we began to experience cold and violent north winds, and we feared that the effects might be harmful and prejudicial to the health. To San Zeferino Papa, 2 leagues. From San Diego, 92 leagues. We made our day's journey, which was short, in the afternoon. We travelled for two leagues over high hills which were somewhat easier of access than the preceding ones. Midway on the road we passed a village of twenty houses, situated on the shore in a place where the beach was extensive and wide. We came in sight of the Punta de la Concepción, the end of the Canal de Santa Bárbara. We pitched our camp outside, and to the east, of a canyon. In the canyon there was an Indian town consisting of twenty-four houses. The inhabitants received us, and made us presents, in the same manner as the others. They have canoes and live by fishing. The country they inhabit also has a scarcity of fire-wood, but the land is of good quality, and has an abundance of pasture. The cacique of this town was lame, and, for this reason, the soldiers named his town Ranchería del Cojo. The latitude of the Punta de la Concepción was determined by the observation of the meridian altitude of the sun, and was found to be 34° 30', the same as that of the Pueblo de San Zeferino. To the Pueblo del Cojo, 2 leagues. From San Diego, 94 leagues. We followed the road in sight of the sea, and over level country, towards the west, as far as the Punta de la Concepción; and from this point, which is a little more than a mile from the Pueblo del Cojo, we turned towards the north-west as the coast trends. We travelled for two leagues and a half, and halted on the northwestern side of a canyon, in which there is an Indian village of twenty hearths, and two hundred and fifty souls, more or less. An estuary enters this canyon and receives the water of a stream, preventing it from reaching the sea, although the stream emerges from the range with a large flow of water. The natives of the village are very poor; they have no canoes, and live in a half-starved condition. Little can be said in favor of the land they inhabit  it is rugged, desolate, and is lacking in fire-wood. At this place a soldier lost his sword; he allowed it to be stolen from his belt, but he afterwards recovered it as the Indians who had seen the act ran after the thief who had committed the robbery. For this reason the name of Ranchería de la Espada stuck to the village. To the Ranchería de la Espada, 2 leagues. From San Diego, 96 leagues. We travelled for two leagues over high land along the shore, but it was easy of access. The watering-place near which we halted was a spring of very good water. There was near it a small, poor Indian village of ten little houses and sixty souls. In sight of our camp, and, at most, a gun shot from it, a tongue of land extended into the sea. At this place we gathered many flints suitable for the firearms, and, for this reason, we called the place Los Pedernales. From the observation of the meridian altitude of the sun we found that we were in latitude 34° 33'. To Los Pedernales, 2 leagues. From San Diego, 98 leagues. We left Los Pedernales in the afternoon and proceeded for two leagues towards the north-north-west, on high land along the shore, and over sand-dunes. We halted in a canyon where there was an abundance of pasture for the animals, but of the water, which stood in a pool, there was very little. The soldiers called it the Cañada Seca. Before reaching these sand-dunes the coast is broken and steep with many rocky points extending into the sea. To the Cañada Seca, 2 leagues. From San Diego, 100 leagues. From the Cañada Seca we went to the Río Grande de San Verardo; about this some natives had given us information by signs upon our arrival at the Cañada Seca. We would not believe, however, that it was at such a short distance from that place, and did not credit them until, at the time of loading the pack animals in the morning, we saw all the inhabitants of the village on the river  men, women, and children  coming to meet us. We arrived at the place after a march of a little less than a league. The mouth of this river is entirely closed by a sand-bank which we crossed dry-shod. The river seems to be dammed up, and is without current. Higher up, however, the current could be seen clearly  incontestable evidence that the water sinks into the sand, and, in this way, reaches the sea. This river flows through a very beautiful valley containing many willows, and much land capable of producing all kinds of grain. We saw bears of great size, and many of their tracks. To the Río Grande de San Verardo, 1 league. From San Diego, 101 leagues. We set out from the Río de San Verardo in the morning, and travelled for two leagues towards the north over level ground, very thickly covered with wild rosemary and other fragrant bushes, until we reached a canyon where there was an abundance of pasture. We passed directly through it, and, when we ascended its northern side, we discovered an Indian village by the side of a moderately large pond surrounded by low hills. The natives here were poor  they had no houses and we doubted if this place was their permanent abode. They honored us with a dance, and it was the first place where we saw the women dance. Two of these excelled the others; they had a bunch of flowers in their hands, and accompanied the dance with various graceful gestures and movements without getting out of time in their songs. We called the place the Ranchería del Baile de las Indias. To the Ranchería del Baile de las Indias, 2 leagues. From San Diego, 103 leagues. From the Ranchería del Baile de las Indias we directed our course inland, towards the north, leaving the coast in order to avoid the shifting sands of the dunes by which it is bordered, and other difficult places. It was not possible, however, to avoid a mountain chain that crossed our way, and extended from the interior of the country; but the sandy ground did not last long. We then proceeded over high hills, and through canyons containing very good soil and good pasture. We pitched our camp in a large valley, near a lake of great extent containing fresh water  it must have been some two thousand yards long, and as much as five hundred wide, possibly more in some places. We gave to the whole valley the name the Laguna Larga. It is three leagues from the place we set out from in the morning. There were in this valley two Indian villages: the one small and miserable, the other larger, being composed of several small houses. To the Laguna Larga, 3 leagues. From San Diego, 106 leagues. The scouts returned from their exploration in the morning and relieved us from the apprehension they had occasioned us by failing to return to camp on the previous afternoon. The reason for their delay was that they had lost the road on account of the fog which obliged them, on their way back to camp, to spend the night in the valley; they had already reconnoitered the day's march we were to make. This was of three leagues, and crossed the valley which is two leagues wide in the direction  north-northwest  that we followed. The remainder of the road, we travelled over high tablelands as far as the watering-place. This was another large pond, almost circular in form, in a canyon which some sand-dunes obstructed, impounding the water, preventing it from emptying into the sea. The whole canyon was covered with rushes and reeds, the ground was wet and swampy, and entirely impassable. The canyon extended, in its whole length, from east to west. In the afternoon, as they had seen many tracks of bears, six soldiers went out hunting on horseback, and succeeded in shooting one. It was an enormous animal: it measured fourteen palms from the sole of its feet to the top of its head; its feet were more than a foot long; and it must have weighed over 375 pounds. We ate of the flesh and found it savory and good. We named this whole place the Laguna Redonda. To the Laguna Redonda, 3 leagues. From San Diego, 109 leagues. The people and the animals rested to-day, and the scouts, who had set out to search for a pass through the range, returned in the afternoon, enlarging upon the difficulty they had experienced in reaching even to its foot  a fact we had discovered already by inspecting the country. There were immense sand-dunes along the shore, and on the plain there were creeks, estuaries, and marshes, which formed a labyrinth. The mountain range we had in sight is the same  in our judgment  that we have been leaving continuously on our right since we set out from San Diego; in some places it recedes from the sea, and in others approaches it, absolutely cutting off the passage along the beach, as happens at this place. In order to avoid the marshes of the plain and the estuaries that reach to the foot of the mountain range, we directed our course to the west over the sand-dunes; these we crossed at the narrowest point  half a league only  discovered by the scouts. We then descended to the beach, and proceeded along it for about a league to the north-northwest. Turning to the east, we again went inland, crossing the sanddunes at another narrow place of half a league. We afterwards reached firm ground on a tongue of land between two bodies of water. To the right, there was a pond of fresh water, which the sand-dunes dammed up, and kept from emptying into the sea. To the left, an estuary extended into the plain; we rounded it, travelling towards the north-northeast. We afterwards took a course to the north and entered the range through a pass, or canyon, covered with live-oaks, alders, willows, and other trees. In the same canyon we pitched our camp on the bank of a stream covered with watercress. On this day's march we travelled four leagues. On the whole road we came upon only one small and wretched Indian village. This part of the country is practically uninhabited. The Indians of this village, which was only a short distance from our quarters, came in the afternoon to visit us; they brought presents of seeds and some fish, and offered them to us. Their cacique had a large deformity, consisting of a tumor that hung from his neck. The soldiers, when they saw it, gave him the nickname of Buchon, and this name likewise stuck to his village and to the entire place. To the Ranchería del Buchon, 4 leagues. From San Diego, 113 leagues. We continued our march through the same canyon, which turned towards the northwest. After a short distance we left it and made our way over hills and high slopes not far from the coast. The country was rough and difficult of passage, with many ups and downs, yet pleasant and covered with live-oak and white oak. We did not see a single native on this day's march, which was of two leagues. We pitched our camp in a very narrow canyon, surrounded by very high hills, and containing running water and sufficient pasture for our horses. The place was named the Cañada Angosta. To the Cañada Angosta, 2 leagues. From San Diego, 115 leagues. The scouts returned, enlarging upon the roughness and impenetrability of the road that awaited us on the following day's march. After hearing their account, it was decided to rest at this place and to send pioneers ahead to clear a way through the difficult passages of the mountain range. In this work they occupied the entire day. We left the canyon, passing over high steep hills. The bad road continued for more than three leagues, until we descended to another extensive canyon containing many pools of water, in which the horses could not drink because the banks were very miry. This compelled us to prolong the day's march as far as a stream of very good water which we found on our way a league farther on; we pitched our camp on its banks. In this canyon we saw troops of bears; they had the land plowed up and full of the holes which they make in searching for the roots they live on, which the land produces. The natives also use these roots for food, and there are some of a good relish and taste. Some of the soldiers, attracted by the chase because they had been successful on two other occasions, mounted their horses, and this time succeeded in shooting one. They, however, experienced the fierceness and anger of these animals  when they feel themselves to be wounded, headlong they charge the hunter, who can only escape by the swiftness of his horse, for the first burst of speed is more rapid than one might expect from the bulk and awkwardness of such brutes. Their endurance and strength are not easily overcome, and only the sure aim of the hunter, or the good fortune of hitting them in the head or heart, can lay them low at the first shot. The one they succeeded in killing received nine bullet wounds before it fell, and this did not happen until they hit him in the head. Other soldiers mounted on mules had the boldness to fight one of these animals. They fired at him seven or eight times and, doubtless, he died from the wounds, but he maimed two of the mules, and, by good fortune, the men who were mounted upon them extricated themselves. The canyon was given the name of Los Osos. To the Cañada de los Osos, 4 leagues. From San Diego, 119 leagues. We made this day's march through the same canyon, which steadily turns to the west, and followed it as far as the sea. We encountered some obstacles on our road, consisting of deep gullies which it was necessary to make ready for the passage of the animals. At a distance of two leagues, we halted on a hill in sight of the sea, and near a stream of very good water covered with watercress. The land was pleasant, of good quality, with abundant pasture and quite a number of trees. Not far from our quarters there was a small and miserable Indian village with hardly sixty souls. They lived in the open, without house or hearth. They came to visit us, and offered us a kind of pinole made of roasted seeds, which tasted good to all of us and had the flavor of almonds. An estuary of immense size, which to us seemed a harbor, enters this canyon on the south side; but its mouth, opening to the southwest, is covered with reefs that cause a furious surf. At a short distance to the north of the mouth, and in front of our camp, there was a very large rock, shaped like a round head. At high tide it becomes an island, and is then separated  a little less than a gunshot  from the shore. From this rock the coast extends to the west-northwest as far as a great point of land which we could discern terminating in the sea. Between this point and another headland we were leaving behind, the coast forms a large bay, providing shelter from the south, southwest, and west winds, if it have sufficient anchorage. To the Cañada de los Osos, 2 leagues. From San Diego, 121 leagues. We proceeded for three leagues along the beach, where there were very many pools of clear water which comes down from the mountain range  at this point only a short distance from the sea. We halted in a moderately wide canyon; into this an estuary entered into which flowed a stream of good water that came from the mountains. The hills inclosing this canyon on the west extended to the sea and obstructed the passage along the beach. The road was left free, however, to the north and northwest; two branches of the canyon followed these directions and gave us the choice of the course that we might wish to take. This place was given the name of El Estero. To El Estero, 3 leagues. From San Diego, 124 leagues. We entered the branch of the canyon that turned to the north-northwest, and followed it for a distance of three leagues. We left it afterwards  because it turned towards the north  and came to the top of some low hills to the northwest. From this point we beheld the mountain range covered with pines and a very deep canyon thickly grown with willows, poplars, pines, and other trees, in which ran a small river with considerable water, that some maintained was the Río del Carmelo. We pitched our camp in the upper part of the canyon. This was named La Cañada del Osito because some Indians from the mountains, who came down to visit us, brought with them a bear cub they were taming and offered it to us. There must have been as many as sixty men [in the party]. To the Cañada del Osito, 3 leagues. From San Diego, 127 leagues. We descended to the shore, and followed the beach, which turned to the northwest. We covered a league and a half over a good road with watering-places at every step. We halted on a steep cliff at the edge of the sea, in the northwestern part of a canyon, through which emptied a stream of very good water; there was pasture and fire-wood in abundance. In this place the meridian altitude of the sun was observed, and from this we found the latitude to be 35°35'. To El Cantil, 1 league. From San Diego, 128 leagues. We followed the coast over high hills and rolling lands. The road was frequently interrupted by ditches and gullies (all full of water), and the making of it gave the pioneers much to do  now cutting brush with hatchets and machetes, now opening the way with pickaxes and crowbars. We arrived at a point of land terminating in the sea, and passed it to the left; entering through a gorge in the range, we continued our march to the north-northwest, crossing different canyons and gullies. We halted on a slope, in the upper part of a canyon or deep water-course, which had sufficient water in a pool. We travelled for about three leagues on this day's march. To the Arroiada Honda, 2 leagues. From San Diego, 130 leagues. We travelled for two leagues, part of the way through the canyon or water-course, and part over cliffs in sight of the ocean. We pitched our camp between two streams of good water, and at the foot of the mountain range which at this point is very high and terminates in the sea; it seemed, however, to permit of passage through an opening we saw to the east. We thought that this might be the range known by the name of Santa Lucía in the sailing-directions of the pilots who navigated these seas, and, particularly, by those who sailed with Sebastián Vizcaíno. Therefore, our commander, desirous of assuring himself on this point, and with the object of exploring the land with the necessary thoroughness  rightly presuming that this would be the most difficult passage to surmount on the whole journey (as the old accounts dwell upon its ruggedness)  resolved to rest at this place, and to send out the most intelligent scouts to examine the country completely, penetrating as far as they could without limiting the time of their return. So eight scouts, with Captain Fernando de Rivera, set out after midday. To the foot of the Sierra de Santa Lucía, 2 leagues. From San Diego, 132 leagues. At nightfall the scouts returned confirming our fears in regard to the difficulty and roughness of the range. The report they gave us of having found a pass served, however, as a consolation, even though it was necessary to make a road with crowbar and pickaxe. Very early in the morning the pioneers were ordered out to begin the work. They returned at night, having cleared the road for the first day's march that we had to make through the mountain range. We entered through the canyon which allowed us passage into the mountains, following it now on one side and now on the other as the lay of the land permitted. This canyon was very narrow; in some places the hills surrounding it were cut away at the foot, and were all inaccessible, not only to the men but even to goats and deer. A stream of water, which we crossed many times before we arrived at the place where we encamped, ran in the bottom of the canyon; it here divides into two branches: the one extending to the east-northeast, the other to the north. Somewhat farther to the northwest we saw a hill which was not as steep as those in the rest of the canyon; over the slope of this hill we had to ascend, first opening the way. We travelled for a little more than a league on this day's march. After the people had eaten, we began the work, in which all without exception took part. The men were distributed in several parties from the camp to the place we had determined upon as the end of the day's march. We succeeded in finishing the whole section in the afternoon. To the Sierra de Santa Lucía, 1 league. From San Diego, 133 leagues. We ascended the slope, and, following the crest of the hills which formed the north side of the canyon we have mentioned, we descended another very long slope, and pitched our camp in a hollow where some natives lived together without either house or home. There could not have been more than sixty souls, a very mild and obsequious people. We covered, at the most, one league on this day's march, and we gave the place the name of the Hoya de Santa Lucía. To the Hoya de Santa Lucía, 1 league. From San Diego, 134 leagues. Very early in the morning the people set out for the work of preparing the road; very few remained in the camp. Despite their working the whole day they had to return without having completed the stretch over which we had to pass on the following day's march. The whole day and the greater part of the people were employed in the same work, which was finished. Early in the morning we set out and began to ascend a very rough slope. We afterwards proceeded along the side of a narrow and deep canyon, which contained running water. We descended into the canyon, crossed the stream two or three times that runs through it  the canyon was somewhat wider at this place  and again ascended a very long slope. From the top of the hill we commanded the mountain range, which extended in all directions, without seeing its end on any side  a sad outlook for these poor travellers, tired and worn out by the fatigue of the journey, by the task of clearing rough passages and breaking roads through hills, woods, dunes, and swamps. The cold began to be felt; we had already many soldiers afflicted with scurvy and rendered incapable of service, the toil of which increased for those who remained on their feet. We covered two leagues on this day's march, and halted in a small and exceedingly narrow canyon in which we hardly found room enough for our camp. The watering-place was small; the water stood in pools; the pasture was extremely scarce. There were three bands of Indians in the immediate neighborhood  wandering people without either house or home. At this time they were engaged in collecting pine nuts, which the many trees of these mountains yield in abundance. The scouts, who had set out in the afternoon to explore the country, returned with news of having seen a water-course, and a canyon, convenient for the removal of our camp, having sufficient pasture for the horses, which were in great need of it. They likewise told us that the range was somewhat more passable in the direction they followed to the east-northeast, although it was far from the course that was convenient for us to take. They assured us, however, that the country gave signs of being more easily traversed farther on in a better direction. Through the same Sierra de Santa Lucía to the Real de los Piñones, 2 leagues. From San Diego, 136 leagues. There were several bad passages to clear in order to reach the canyon that had been explored, and to do this the pioneers set out early in the morning. We deferred our march until the afternoon, in order to give them time to finish the work. The march was resumed after the people had eaten, and we proceeded for one league over broken country  less rugged, however, than that previously traversed. We pitched camp on the bank of a small river containing much running water, which, in several pools or eddies, held a considerable number of trout, and other species of fish. We gave the place the name of Río de las Truchas. To the Arroyo de las Truchas, 1 league. From San Diego, 137 leagues. We rested at this place so as to give time for the scouts to examine the country carefully, and also to allow the animals to recuperate somewhat, as they were in bad condition. After nightfall, the scouts returned from their reconnaissance with good news. They said that they had pushed forward for twelve or fourteen leagues, and had followed a canyon as far as its outlet in the sea; in this, however, they were greatly deceived  as we all found out afterwards  by the heavy fog which filled the canyon towards the sea. They believed, also, that they had seen the beach, but this was still quite distant. Through the canyon flowed a river which they took to be the Carmelo, as they saw large trees on its banks  poplars, willows, oaks, and other kinds. With this news the men were greatly rejoiced; they all bestirred themselves, supposing that the goal towards which we were marching was only a short distance away; with desire we anticipated our arrival. We set out and proceeded for about two leagues, over low-lying hills, towards the north, and, at times, towards the northeast. We descended a slope; at the foot of it dowed a considerable stream of water. Its course was eastward, and turned, afterwards, to the north, uniting with the Río de las Truchas  as we understood from the natives. The whole country over which we travelled, especially from this stream onward, was covered on both sides with white and live-oaks, as high and of as great girth as can be found in the finest parks of Europe. All the trees were loaded with acorns, as yet unripe; the crop would be so great that many herds of swine could be maintained. The Indians use them in making their atole  of which we have partaken in various places  and they also roast them, and eat them as bread. On the margin of this stream there was a village of very poor, wandering Indians, but they showed themselves friendly and obsequious. To the same Sierra de Santa Lucía, 2 leagues. From San Diego, 139 leagues. Forewarned that we would not find water until we reached the river, of which the scouts gave us information, we set out in the afternoon, after watering the animals. We halted in the bottom of a canyon, a little more than a league to the northeast from the place which we left. The ground of this canyon is stony; in the canyon there are many white oaks and live-oaks. Through the same Sierra de Santa Lucía, 1 league. From San Diego, 140 leagues. We travelled towards the northeast through the same canyon that we followed on the preceding day. The canyon gradually became narrower, and the rocky white hills which surrounded it join completely at its end, but a pass was left that was not at all difficult, by which one could descend to the bed of the river which the scouts believed to be the Carmelo. Here there was a slope of no great importance, very thickly covered with different bushes, among others some wild chestnuts, the fruit of which has a bitter taste. At the foot of the slope was a band of wandering Indians, which must have numbered more than two hundred souls. They had no houses, and lived in the open near a fallen oak tree. For this reason the place was named Ranchería del Palo Caido. These natives offered us a quantity of pine nuts and seeds. We remained a short time among them, and then passed on in order to make our camp on the bank of the river which most of us believed to be the Carmelo. The borders of this river are very thickly covered on both sides with willows, poplars, oaks, and other kinds of trees; and the whole plain that it waters is luxuriant of foliage. The soil seems to be of good quality, and produces a variety of fragrant plants, among others the rosemary, which abounded, the sage, and rosebushes loaded with blossoms. This day's march was of three leagues, and the camp, which we placed upon the plain adjoining the river, came to be known by the name of El Chocolate. To the Real del Chocolate, 3 leagues. From San Diego, 143 leagues. The pioneers having cleared the land along the river, we crossed it where it divided into three branches below a body of standing water which had formed large pools, and which contained many fish. Some of the soldiers said that they had seen fish [in it] weighing as much as eight or ten pounds. We left the river-bottom, and continued our march over level open country, approaching a little the hills that bounded the canyon on the north, until we reached again the steep bank of the river-bottom which paralleled these hills. They turned to the northwest, and obliged us to take to the slopes of the hills we had on our right. When the lay of the land permitted, we continued our march over level ground, without going very far from the river. We pitched our camp near some pools in a spot provided with pasture, which is not abundant in all parts of the canyon. At this place there was a poplar tree which we enclosed within our camp, and for this reason the place was called Real del Alamo. It is four leagues from the Real del Chocolate. To-day we saw many herds of antelopes crossing the plain, but none of them came within range. To the Real del Alamo, 4 leagues. From San Diego, 147 leagues. There was not, nor could we desire, a better road than that through the same canyon, which opened towards the northwest and gradually widened as we drew nearer to the coast, following the course of the river, which meandered without hindrance among the hills that bordered the coast. The day's march was four leagues. We pitched our camp in the river-bottom amid a clump of live-oaks. The land at this place was of a whitish color, whence came its name of Real Blanco. During the march we again saw several herds of antelopes, but they were out of range and up in the hills. From the Real Blanco, 4 leagues. From San Diego, 151 leagues. This day's march was a little shorter than the one of yesterday. We proceeded for three leagues and a half over whitish, treacherous ground into which the animals sank; it, however, had a greater abundance of pasture. We halted beside the river, which at this place flowed with greater force and noise. Many antelopes were seen during the march. This camp was given the name of Los Cazadores, because here we had come unexpectedly upon some natives, who were so engrossed in their hunting that they did not see us until we were upon them; then, startled, they fled, and no efforts of ours were sufficient to induce them to return. To the Real de los Cazadores, 3 1/2 leagues. From San Diego, 154 1/2 leagues. We proceeded for another three and a half leagues, down-stream, to the northwest and west-northwest. The hills gradually became lower, and, spreading out at the same time, made the canyon wider; at this place, in sight of two low points formed by the hills, it extends for more than three leagues. The soil was of the same quality as that we have mentioned above  treacherous footing, full of fissures that crossed it in all directions, whitish in color, and scant of pasture. From our camp we could hear the sound of the ocean, but we could not see the shore. Therefore, desirous of knowing on what part of the coast we were, and convinced that we could not be very far from the desired port of Monterey, and that the mountain range which we were leaving behind was assuredly that of Santa Lucía  as we inferred from the account written by Father Torquemada, which treats of the expedition and voyage of General Sebastián Vizcaíno, and from the sailing-directions of the pilot Cabrera Bueno  our commander resolved that the scouts should set out promptly to explore the coast and the mouth of the river. They returned saying that the river emptied into an estuary which entered the canyon from the sea; that the beach, bordered by sand-dunes, had been seen to the north and south, the coast forming an immense bay; and that, to the south, there was a low hill covered with trees like pines which terminated in a point in the sea. On hearing this news some began to suspect that we might have left behind us the port we were seeking, by reason of the great circuit we had made in passing through the mountain range which we traversed in a northeasterly and northerly direction until we descended to the canyon which permitted us to resume the road along the beach towards the northwest and west-north-west. They added that the Punta de Pinos, which appeared to the south, was a strong indication of it, for it is one of the landmarks given in the sailing-directions for the port of Monterey. They also stated that the large bay, about which the scouts gave particulars, was, without doubt, the one that lay between the Punta de Año Nuevo and the above mentioned Punta de Pinos. These reasons somewhat worried all of us, and to these could be added the fact that we were above 36° 30' north latitude; so it was considered a most necessary measure to reconnoiter this point before undertaking anything else. Through the same canyon, 3 1/2 leagues. From San Diego, 158 leagues. We approached somewhat nearer the beach, following the course of the river for about a league. Some of the officers afterwards went with the engineer to examine this beach. There they observed the large bay which the scouts had seen. Its northern point, which ran a considerable distance into the sea, bore northwest at a distance  in their judgment  of eight maritime leagues; the southern point, which formed the hill of pines, bore southwest by south. They did not see the mouth of the estuary because it does not enter and join with the sea where they were, but very much farther to the north. It was not possible to observe the meridian altitude of the sun with the octant to determine the latitude of the place, because the coast prevented a clear horizon either to north or south. Through the same canyon, 1 league. From San Diego, 159 leagues. The scouts set out in the morning with a great desire to reconnoiter the Punta de Pinos, convinced that they would not fail to find the port of Monterey which we imagined had been left behind. As it was not possible yesterday to observe the meridian altitude of the sun on the shore, this calculation was made in the camp by means of the gnomon. The hypotenuse of the right angled triangle was taken as 8000 parts of those into which the line of equal parts of the pantometer, or proportional compasses from a box of mathematical instruments, is commonly divided, and the meridian shadow was taken as 4338. From this, the angle of the meridian altitude of the sun came out 57° 10'; its zenith-distance 32° 50'; its declination was 3°54'; the latitude of the place was therefore 36° 44'. The scouts returned in the afternoon and said that they had not seen a port, either to the north or south of the Punta de Pinos; they did see, however, a small bay lying between the said Punta de Pinos and another point farther to the south. This bay had a stream flowing into it from the mountain range, and an estuary into which the stream emptied. Farther on, the rocky coast extended to the south-southwest; its impenetrable ruggedness obliged them to turn back, and they believed that the steep cliff they had in sight was the same that had obliged us to leave the shore, and to pursue our way through the mountains. Our commander, somewhat confused by these reports, determined to call a meeting of his officers to consider what action was most suitable in the present exigency. He drew attention to the scarcity of provisions that confronted us; to the large number of sick we had among us (there were seventeen men half-crippled and unfit for work); to the season, already far advanced; and to the great sufferings of the men who remained well, on account of the unlimited work required in looking after the horses, and watching them at night, in guarding the camp, and in the continual excursions for exploration and reconnoissance. The meeting was held after we had heard the mass of the Holy Ghost, and all the officers voted unanimously that the journey be continued, as this was the only course that remained, for we hoped to find  through the grace of God  the much desired port of Monterey, and in it the packet San Joseph which would relieve our needs; and, if God willed that in the search for Monterey we should all perish, we would have performed our duty towards God and man, laboring together until death for the success of the undertaking upon which we had been sent. The scouts set out early in the morning to examine the country so that we might continue our journey. The scouts returned in the afternoon with very pleasant news. They had found a river [valley] of great verdure and with many trees of Castile, and they believed that they had seen another point of pines to the north (it was afterwards known, however, that they had been deceived because it was very foggy). They likewise saw tracks of large animals with split hoofs, and thought they might be bison; and a populous village of Indians who lived in huts covered with thatch, and who, according to what they said, must have numbered over five hundred souls. These Indians had no notice of our coming to their lands, as our men could see from the consternation and fright which their presence caused: amazed and confused, without knowing what they did, some ran for their weapons, others shouted and yelled, and the women burst into tears. Our men did all they could to quiet them, and succeeded with great difficulty. The sergeant of the presidio of Loreto, who was in command of the party, dismounted and approached them with signs of peace. The Indians did not allow him to reach their village; they made him signs to stop, and, at the same time, taking their arrows they stuck them all, point first, into the ground; they did the same with other darts and plumes which they brought immediately. They withdrew afterwards, and as the scouts understood that this had been done as a sign of peace, several of them dismounted and took some of these arrows and darts. The natives were very much pleased, and applauded this act of our men, who, to assure them still further that their intention was not to injure them, but rather to seek their friendship, asked them by signs for food. Upon this the contentment of the Indians was increased, and their women immediately set themselves to grind seeds, from which they made some round pats which they gave to our men. The sergeant gave the Indians some glass beads, and they were well satisfied and content. We proceeded for two leagues over the plain where we experienced some delay in crossing two swampy ditches which we found on our way. We had to fill them in with earth and fascines so that the pack-animals and horses could pass. We pitched our camp between some low hills near a pond where we saw a great number of cranes  the first we had seen on this journey. During the night extreme unction was administered to one of the sick whose condition had become very serious. This place was given the name of Laguna de las Grullas. To the Laguna de las Grullas, 2 leagues. From San Diego, 161 leagues. We continued our way over hills that were higher than those we were leaving behind; in every depression of the land there was a pond of greater or lesser extent, which obliged us to make many circuits. After marching for four leagues we arrived at the village of which the scouts had given us information; contrary to our expectations, we found it deserted, for on leaving the Laguna de las Grullas we saw, near the camp, arrows and darts stuck in the ground, and at the foot of them some shell-fish which the Indians, without allowing themselves to be seen, had placed there during the afternoon or evening of the preceding day. These signs of peace convinced us that they would allow us to meet and become friendly with them in their village; but the suspicion and fear of these barbarians caused them to desert it. This circumstance we all regretted, as we needed them greatly  chiefly to obtain information in regard to the country, and to accompany the scouts in their explorations, from which we hitherto derived great advantage. We pitched our camp on the bank of the river discovered by the scouts, not far from the village which stood near the riverbottom. This was verdant and pleasant, covered with poplars, alders, and tall white oaks, live-oaks, and another kind of tree that we did not know. Here we saw a bird that the natives had killed and stuffed with grass; it appeared to be a royal eagle; it was eleven palms from tip to tip of its wings. On account of this find we called the river the Río del Pájaro. To the Ranchería del Pájaro, 4 leagues. From San Diego, 165 leagues. The short and cloudy days did not give the scouts opportunity to examine the country, especially as we arrived somewhat late at the camping-place. This obliged us to rest here in order to give the scouts time to make their exploration. They left early in the morning and were given the day for this purpose. They examined the country for [a distance equal to] two day's march of the pack-animals, and returned without any information of importance  which greatly depressed us, considering the scarcity of the provisions and the embarrassment caused by the sick, who could not shift for themselves, the number of the ailing increasing every day. We left the Río del Pájaro and proceeded for one league over level ground, not being able to continue the march farther as the sick were already exhausted, falling down from their mules. We halted near a small pond formed between some low hills  a place with plenty of water and pasture. To the Cañada de Lagunilla del Corral, 1 league. From San Diego, 166 leagues. The sick were in such a serious condition and so near the end, that, the sacrament having already been administered to several of them, we realized it would be exposing them to the possibility of dying on the road if we did not give them some respite and quiet. Our commander resolved, therefore, that they should rest at this place, and that we should proceed as soon as they felt better. In order to save time, however, and to obtain information about the port of Monterey, which we all believed to be near, he ordered a party to set out, and to advance as far as the animals  they were growing very thin from the cold  could go. The sergeant of the presidio with eight men set out on this exploration, each one taking three mules as remounts. Nothing happened to-day; the sick felt somewhat better. We were anxiously awaiting the scouts who returned in the afternoon. The sergeant reported that they had travelled about twelve leagues without having learned anything of the port for which we were searching, and that they had reached the foot of a high, white mountain range. We set out from the Laguna del Corral  a name given to it on account of a piece of fence that was constructed between the lake and a low hill in order to keep the animals penned by night with few watchmen. We marched very slowly so as to cause the sick as little distress as possible; we contrived to carry them on side-saddles, as the women in Andalusia travel. We proceeded for a league and a half, and halted near another small pond in the bottom of a narrow and very pleasant little canyon, with plenty of fire-wood and pasture. The road was somewhat difficult. We directed our course to the north-northwest, without withdrawing far from the coast, from which we were separated by some high hills very thickly covered with trees which some said were savins. They were the largest, highest, and straightest trees that we had seen up to that time; some of them were four or five yards in diameter. The wood is of a dull, dark, reddish color, very soft, brittle, and full of knots. This canyon was given the name of La Lagunilla. To La Lagunilla, 1 1/2 leagues. From San Diego, 167 1/2 leagues. From La Lagunilla we came to the bank of a stream of good water, at a distance of two leagues to the west-northwest, travelling in sight of the sea. On our road there were two bad places over which we had to make a way. The first of these was a deep gully thickly grown with brush; the other, a ditch in which, to descend and ascend its sides, we had to open a path. This place was afterwards called El Rosario. To El Rosario, 2 leagues. From San Diego, 169 1/2. At a distance of two leagues from El Rosario we forded a river considerably swollen; the water reached to the girths of the animals. The descent to the river, and the ascent after we forded it, gave the pioneers much work in clearing and opening a way through a thicket that covered the river-bottom. The same thing had been done at another stream which we had crossed shortly before. We pitched our camp on the right bank of the river which was named San Lorenzo. To the Río de San Lorenzo, 2 leagues. From San Diego, 171 1/2 leagues. We continued to follow the direction of the coast  west-northwest  over high hills which were steep on the side towards the sea. The shore is practically without beach on the whole stretch of two leagues over which we travelled. There were three bad places, in as many canyons, where we had to make a road. These canyons contained running water in very deep ditches, over which it was necessary to lay bridges of logs covered with earth and fascines, so that the pack-animals could cross. We pitched our camp on a low hill near the shore, on the eastern side of a canyon which extended from the mountain range, and contained a stream of good water. This place was called Las Puentes. To Las Puentes, 2 leagues. From San Diego, 173 1/2 leagues. The march we made on this day was toilsome on account of the many ravines we came upon  there were seven or eight of them  all of which gave the pioneers much work, one especially because of its depth and the ruggedness of its sides. Into this fell the mule that carried the kettle, and for this reason the place was named the Barranco de la Olla. The coast turns more to the northwest, and is everywhere precipitous, excepting at the outlet of these ravines where there is a short stretch of beach. To our right there were some whitish, barren hills that filled us with sadness, and there were days on which we missed the comfort of seeing natives. We halted on a very high hill and in sight of the white mountain range, which the scouts had discovered, where some clumps of pines could be seen. At the foot of the low hill, to the right and left, ran some streams containing plenty of water. To-day we travelled for two leagues and a half. This place was given the name of Alto del Jamón. To the Alto del Jamón, 2 1/2 leagues. From San Diego, 176 leagues. As we set out from the camp a very long slope presented itself; this we had to ascend after crossing the stream which flowed at the foot of the hill to the north. It was necessary to open the way with the crowbar, and in this work we were employed the whole morning. We afterwards travelled a long distance along the backbone of a chain of broken hills, which sloped down to the sea. We halted on the same beach at the mouth of a very deep stream that flowed out from between very high hills of the mountain chain. This place, which was named the Arroyo or Cañada de la Salud, is one league, or a little more, from the Alto del Jamón. The coast, in this locality, runs northwest by north. The canyon was open towards the north-northeast, and extended inland for about a league in that direction. From the beach a tongue of land could be seen at a short distance, west by north. It was low, and had rocks which were only a little above the surface of the water. To the Cañada de la Salud, 1 league. From San Diego, 177 leagues. We rested in this canyon while the scouts employed the day in examining the country. facing the sun, the meridian altitude of the lower limb of the sun was found to be ... 41°41'30"
Altitude of the center of the sun ... 41°54'30"
Its declination at that hour was ... 11°2'3"
During the afternoon and night heavy showers fell, driven by a very strong south wind which caused a storm on the sea. The day dawned overcast and gloomy; the men were wet and wearied from want of sleep, as they had no tents, and it was necessary to let them rest to-day. What excited our wonder on this occasion was that all the sick, for whom we greatly feared lest the wetting might prove exceedingly harmful, suddenly found their pains very much relieved. This was the reason for giving the canyon the name of La Salud. We moved the camp a distance of two leagues from the Cañada de la Salud, and camped near an Indian village, discovered by the scouts, situated in a pleasant and attractive spot at the foot of a mountain range and in front of a ravine covered with pine and savin, among which descended a stream from which the natives obtained water. The land appeared pleasant; it was covered with pasture, and was not without fire-wood. We travelled part of the way along the beach; the rest, from the point of rocks previously mentioned, to the village, over high, level land with plenty of water standing in ponds of greater or less extent. The Indians, advised by the scouts of our coming to their lands, received us with great affability and kindness, and, furthermore, presented us with seeds kneaded into thick pats. They also offered us some cakes of a certain sweet paste, which some of our men said was the honey of wasps; they brought it carefully wrapped in the leaves of the carrizo cane, and its taste was not at all bad. In the middle of the village there was a large house, spherical in form and very roomy; the other small houses, built in the form of a pyramid, had very little room, and were built of split pine wood. As the large house so much surpassed the others, the village was named after it. Note: The point of rocks which we left behind is that known as the Punta de Año Nuevo. Its latitude is, with a slight difference, the same as that of the Cañada de la Salud. To the Ranchería de la Casa Grande, 2 leagues. From San Diego, 179 leagues. The Indians of La Casa Grande furnished us with guides to go forward. We travelled to the north over high hills, not far from the shore. We encountered a number of slopes which were rather troublesome, and we had to put them in condition for travel-as also the crossing of two streams, thickly grown with brush-before we arrived at an Indian village, two leagues from the place from which we started. This we found to be without its inhabitants, who were occupied the time in getting seeds. We saw six or seven of them at this work, and they informed us that a little farther on there was another and more populous village, and that the inhabitants of it would make us presents and aid us in whatever we might need. We believed them, and although it was somewhat late we passed on and proceeded for two leagues more over rolling country until we reached the village. The road, while difficult, over high hills and canyons, was attractive. To us, the land seemed rich and of good quality; the watering-places were frequent; and the natives of the best disposition and temper that so far we had seen. The village stood within a valley surrounded by high hills, and the ocean could be seen through an entrance to the west-northwest. There was in the valley a stream of running water, and the land, though burned in the vicinity of the village, was not without pasture on the hillsides. To the Valle de los Cursos, 4 leagues. From San Diego, 183 leagues. Many of the pack-mules were exhausted by the preceding day's march, and they were given a rest to-day that they might recover their strength. The scouts were sent out to examine the country with guides from among these Indians. They returned in the evening without any news of importance; they had gone about four leagues to the north-northwest along the coast. As the captain of the company of the Californias, Don Fernando de Rivera y Moncada, was ill of the common sickness  the scurvy  and, because of a diarrhea which attacked many of us, we were forced to delay the march. We left the valley, which the soldiers called Valle de los Cursos, heading north. Afterwards, we followed the coast over high hills to the north-northwest. We travelled for two short leagues, and halted near a stream of little importance. The country had a gloomy aspect; the hills were bare and treeless, and, consequently, without fire-wood. On the northern side of this stream there were some abandoned Indian huts; all who had the curiosity to look in to see these were covered with fleas. On the road we came upon a very long slope over which we had to make a passage in order to descend to a small stream where it empties into the sea. To the Ranchería de las Pulgas, 2 leagues. From San Diego, 185 leagues. We proceeded for two leagues along the coast over a road similar to that of the preceding day's march, and in the same direction. We halted near another stream in the vicinity of the beach. The place was without fire-wood. Many natives came to our camp, but most of them were from the villages which we had left behind  people who wander over all this land, which is mostly uninhabited. To the northwest of the camp there was a high point of land which terminated in the sea, and in front of it were two large sharp-pointed rocks of very irregular shape. We did not know what to think of the indications: we were already above 37° 20' north latitude, without being certain whether we were distant from or near Monterey. We experienced frequent rains; our provisions were running short; we had our men reduced to the simple daily ration of five tortillas made of flour and bran; we had neither grain nor meat (four packages that remained were reserved for the sick). It was resolved to kill the mules in order to provide rations for the soldiers, but they put off this expedient until a time of greater need, as, now and then, they would kill some ducks, and as all very willingly ate the pinole and seeds which they obtained from the natives, but only in small quantities. To our greater misfortune, our commander became sick, as well as the captain of the presidio. The indisposition and disorder of the bowels was very general and affected nearly all of us, and the author of this record did not entirely escape from it. But as there is no bad from which good does not come, it is also true that this was what principally brought about the relief and improvement of the sick. The change of season, the cessation of the northwest winds and the fogs, and the beginning of the land breezes, which blew after the rainy season, contributed to the same result. The swellings, and the contraction of the limbs, which made the sick like cripples, disappeared little by little. At the same time their pains left them, and all symptoms of scurvy disappeared: their mouths became clean, their gums solid, and their teeth firmly fixed. To the Llano de los Ansares, 2 leagues. From San Diego, 187 leagues. It rained all last night, with wind from the south. At daybreak it was also raining, and it was impossible for us to set out from this place, which, afterwards, for the reason which we shall mention, received the name of Llano de los Ansares. The day dawned with indications of pleasant weather. The wind was cold from the north, and the sky clear. We broke camp, and, following the beach until we left the point of the rocks to the west, we passed over some hills, and crossed some canyons, in which there were deep gulleys of water, which detained us because it was necessary to throw small bridges over them. We halted near the shore, along which the passage was entirely closed by a steep hill, at the foot of which ran a stream of good water. This stream flowed from a hollow formed by various hills; at the extreme end of this, close to the hills, we pitched our camp, which was thus protected to the north. To-day's march was one league. The place was afterwards known by the name of Rincón de las Almejas. In the afternoon, the sergeant of the presidio was sent out to seek a means of egress for the following day's march. To the Rincón de las Almejas, 1 league. From San Diego, 188 leagues. The hills which prevented our passage along the shore, although easy of access for the ascent, had, on the other side, a very difficult and rough descent. The pioneers went out in the morning with the sergeant to make a road over it, and, afterwards, at eleven o'clock, we followed him with the pack-animals. From the summit we saw to the northwest a large bay formed by a point of land which extended a long distance into the sea, and about which many had disputed on the preceding day, as to whether or not it was an island; it was not possible at that time to see it as clearly as now on account of the mist that covered it. Farther out, about west-northwest from us, seven rocky, white islands could be seen; and, casting the eye back upon the bay, one could see farther to the north some perpendicular white cliffs. Looking to the northeast, one could see the mouth of an estuary which appeared to extend inland. In consideration of these indications we consulted the sailing-directions of the pilot Cabrera Bueno, and it seemed to us beyond all question that what we were looking upon was the port of San Francisco; and thus we were convinced that the port of Monterey had been left behind. The latitude of 37° and 33' or 35'  according to the reckoning of the engineer  in which we found ourselves, confirmed our opinion. And thus the point which appeared seawards, and which had seemed to many to be an island, must have been the Punta de los Reyes, although the above mentioned pilot places it in 38° 30'; that is, one degree farther to the north. The authority of this author, however, in the opinion of all intelligent people, and of those who were guided by them, was of little weight, for the test which has been made of his latitudes, shows that they err in being too large. And so, what is there to be wondered at if he places the Punta de los Reyes one degree farther north than it really is when he does the same with the Punta de la Concepción, which he places in 35° 30' when, from repeated observations, it is certain that it is in 34° 30'; and when, according to the same author, the port of San Diego is in 34°, when it is indisputable that its latitude [only] exceeds 32° and a half by some minutes? We descended to the port, and pitched our camp at a short distance from the beach, near a stream of running water which sank into the ground and formed a marsh of considerable extent, reaching nearly to the sea. The country had plenty of pasture, and was surrounded by very high hills which formed a hollow, open only to the northwest of the bay. We travelled for one league. To the Bahía or Puerto de San Francisco, 1 league. From San Diego, 189 leagues. Some had not yet been convinced that we had left the port of Monterey behind, nor would they believe that we were at the port of San Francisco. Our commander ordered the scouts to set out to examine the land for a certain distance, and gave them three days within which to return, hoping that from this exploration they would, perhaps, bring back information that would remove the perplexity of the incredulous. From the coast or inner shore on the south of the bay, the Farallones were sighted west by southwest; the Punta de los Reyes, west sixteen degrees northwest, and some ravines with white cliffs, farther in, northwest by west. Several of the soldiers requested permission to go hunting, as many deer had been seen. Some of them went quite a long way from the camp and reached the top of the hills so that they did not return until after nightfall. They said that to the north of the bay they had seen an immense arm of the sea or estuary, which extended inland as far as they could see, to the southeast; that they had seen some beautiful plains studded with trees; and that from the columns of smoke they had noticed all over the level country, there was no doubt that the land must be well populated with natives. This ought to confirm us more and more in the opinion that we were at the port of San Francisco, and that this was the estuary of which the pilot Cabrera Bueno spoke; we had seen its entrance between some ravines while descending the slope of the bay. In regard to this, in his sailing-directions, Cabrera Bueno uses the following words: "Through the middle ravine, an estuary of salt water enters without any breakers; coming in, you will find friendly Indians, and you will easily obtain fresh water and fire-wood." We also conjectured from these reports that the scouts could not have passed to the opposite side of the bay, as it was no mere three days' undertaking to make the detour rounding an estuary, the extent of which was greatly enlarged upon to us by the hunters. During the night the scouts returned to camp, firing salutes with their arms. They had kept us in a state of great expectation until we all went out to meet them on the road and began to satisfy our curiosity by asking questions and hearing their answers. The reason for their demonstration of joy was none other than that they had inferred from the ambiguous signs of the natives that two days' march from the place at which they had arrived there was a port and a vessel in it. Upon this simple conjecture some of them had finally persuaded themselves that they were at Monterey, and they had no doubt that the packet San Joseph was awaiting us at that place. We set out in search of the port. We followed the south shore or beach of San Francisco until we entered the mountain range to the northeast. From the summit of this range we saw the magnificent estuary which stretched towards the southeast. We left it on our left hand, and, turning our backs on the bay, advanced to the south-southeast, through a canyon in which we halted at sunset. We travelled for two leagues. To the Cañada de San Francisco, 2 leagues. From San Diego, 191 leagues. We followed the coast of the estuary, although we did not see it because we were separated from it by the low hills of the canyon which we were following in a south-southeasterly direction. We travelled for three leagues. The country was pleasant. The hills west of the canyon were crowned with savins, low live-oaks, and other smaller trees. There was sufficient pasture. We halted on the bank of a stream of good water. Some of the natives were seen; they invited us to go to their villages, and offered us their presents of seeds and fruits. Through the Cañada de San Francisco, 3 leagues. From San Diego, 194 leagues. Without leaving this canyon we marched, in the same direction, for three more leagues over pleasanter land, more thickly covered with savins, white oaks, and live-oaks loaded with acorns. Two very numerous bands of Indians met us on the road with presents of pinole and some large trays of white atole, which supplied in large measure the needs of our men. These natives requested us earnestly to go to their villages, offering to entertain us well; they were disappointed because we would not yield to their solicitations. Some of the men asked them various questions by means of signs, in order to obtain from them information they desired, and they were very well satisfied with the grimaces and the ridiculous and vague gestures with which the natives responded  a pantomime from which, truly, one could understand very little, and the greater part of the men understood nothing. Meanwhile we arrived at the end of the canyon where the hilly country, which extended to our left and lay between us and the estuary, terminated. At the same time the hills on our right turned towards the east, and closed the valley which contained the waters of the estuary. We likewise directed our course to the east. We proceeded for a short stretch in this direction, and halted on the bank of a deep stream which descended from the mountain range, and flowed precipitately to the calm waters of the estuary. Through the same Cañada, 3 leagues. From San Diego, 197 leagues. From this place the scouts were sent out in order to obtain definite particulars about the port and the ship concerning which the natives had made signs. For this purpose they were allowed four days, and they carried a supply of flour for the assigned period. The sergeant of the presidio went as head of the party, and some Indians accompanied it as guides. Nothing of importance happened in the camp. Our men, being without meat or seeds, tried the acorns, but most of them suffered great injury to their health, [and had] indigestion and fever. The scouts arrived at night, very downcast, convinced now that the port of Monterey could not be farther on, and undeceived in regard to the information of the natives, and their signs which at last they confessed were quite unintelligible. They said that the whole country which they had gone over to the northeast and north was impassable on account of the absence of pasture, which the natives had burned, and, more than all, because of the fierceness and evil disposition of these people, who received them very badly and tried to prevent them from going on. They stated that they had not seen any evidences whatever that might indicate the proximity of the port, and that there was another immense estuary to the northeast, which extended far inland; that it was connected with that of the southeast; [and if they were to continue] it would be necessary to search for a way around it. Return from the Port of San Francisco in search of the Punta de Pinos and the Sierra de Santa Lucia. After hearing the report of the scouts, the commander decided to call together his officers in order to resolve jointly upon the course that might be suitable to adopt in the present circumstances, bearing in mind the service of God, and of the king, and their own honor. The officers being assembled gave their votes in writing, and resolved to return in search of the port of Monterey which they knew, from consideration of the signs they had noted along the coast, must lie behind them. The missionary fathers likewise attended the meeting, and their opinion was asked for courtesy's sake. They concurred in the decision, recognizing that the return in search of the port of Monterey, which they also knew must lie behind, was necessary. The resolution was put into effect; in the afternoon the camp was moved two leagues from the stopping-place at the estuary, retracing our steps on the return from the port of San Francisco. We travelled for four and a half leagues to the north-northwest. We halted near a small pond in the canyon which we followed coming from the port of San Francisco. To the Cañada de San Francisco, 4 1/2 leagues. From the Estero de San Francisco, 6 1/2 leagues. We travelled for two leagues, and arrived at the port of San Francisco. To the Puerto de San Francisco, 2 leagues. From the Estero de San Francisco, 8 1/2 leagues. We travelled for one league, and halted in the Rincón de las Almejas, a name given because of the abundance of shell-fish on the rocks washed by the sea. The southern shore or beach of the port of San Francisco is about four marine miles north of this place. Its latitude, then, would be about 37°35'. To Las Almejas, 1 league. From the Estero de San Francisco, 9 1/2 leagues. As the men were without provisions, save the very small ration of tortillas of flour, it was decided to rest at this place in order to give time to get a supply of shell-fish, which, as we said, were very abundant on the rocks along the shore. From the day we came in sight of the port of San Francisco until we left it the sky had been clear continuously, but, to-day, a thick fog covered the horizon; the wind was from the south. Nevertheless, we set out from the Rincón de las Almejas, and travelled for a little more than a league, as far as the place which the soldiers now called the Llano de los Ansares, because we saw such an abundance of geese. Some of the soldiers, going out to hunt, killed twenty-two. The Divine Providence was pleased, in this manner, to supply their needs. To the Llano de los Ansares, 1 league. From the Estero de San Francisco, 10 1/2 leagues. The sky was very cloudy when we broke camp, and we had hardly begun our march when the wind changed to the south and became very strong. In a short time the rain began and lasted during the whole march. We travelled for three leagues until we arrived at a deep stream of good water, a little farther south than the Ranchería de las Pulgas. To the Arroyo Hondo, 3 leagues. From the Estero de San Francisco, 13 1/2 leagues. We travelled for three leagues, and passed through the Valle de los Cursos; we found this village deserted. We halted near a stream of good water, two leagues south of the village, dividing the distance so as to arrive on the following day at the Ranchería de la Casa Grande. To the south of the Ranchería de los Cursos, 3 leagues. From the Estero de San Francisco, 16 1/2 leagues. We passed one league from the Ranchería de la Casa Grande, which we likewise found deserted. We halted on a steep rock near the shore, and near a stream of good water, in sight of the Punta de Año Nuevo. We travelled for four leagues. To a point south of the Ranchería de la Casa Grande, 4 leagues. From the Estero de San Francisco, 20 1/2 leagues. From the Punta de Año Nuevo we went to the Alto del Jamón, a distance of four leagues. To the Alto del Jamón, 4 leagues. From the Estero de San Francisco, 24 1/2 leagues. On this day's march we travelled for two leagues  as far as the place called Las Puentes, where we halted. During these days we killed many geese; it was impossible to estimate the number of flocks of these birds which were seen at every step; so no lack of food was felt in the camp. To Las Puentes, 2 leagues. From the Estero de San Francisco, 26 1/2 leagues. We forded the Río de San Lorenzo without stopping there, and continued the day's march as far as the Arroyo del Rosario, a distance of four leagues from the Alto del Jamón. To El Rosario, 4 leagues. From the Estero de San Francisco, 30 1/2 leagues. This day's march brought us to the Laguna del Corral, a distance of three leagues and a half from El Rosario. To the Laguna del Corral, 3 leagues. From the Estero de San Francisco, 33 1/2 leagues. From the Laguna del Corral, the scouts set out to examine the country with renewed care, as the road which it was necessary for the animals and men to follow extended somewhat inland. We halted one league farther on than the Río del Pájaro, near a pond which was called Laguna del Macho. To the south of the Río del Pájaro, or to the Laguna del Macho, 2 leagues. From the Estero de San Francisco, 35 1/2 leagues. With the object of examining the coast with minuteness and care, we rested at the Laguna del Macho. The scouts returned at night without any important information. They only said that they had found out that the tracks which we had seen on the way to the port of San Francisco were not those of bison, but of very large deer, of an extraordinary appearance; they had seen a herd of twenty-two near the shore. They said that these animals had high branching and heavy horns; that their color, from the breast to the chin, was white, the rest of the body a light chestnut, excepting the hind quarters, which likewise were white. From the Laguna del Macho we came to our old camping-place at the river which was thought to be the Carmelo, a distance of five leagues and a half from the Laguna del Macho. To the Río Carmelo, 5 1/2 leagues. From the Estero de San Francisco, 41 leagues. We ascended the river about a league, and forded it at a place where its waters, before mixing with those of the sea, permitted the crossing. We directed our course to the southwest over a level country covered with thickets, without much pasture, with some clumps of small liveoaks. We rounded a fair-sized pond, passing over some sanddunes between it and the sea. We pitched our camp in sight of the Punta de Pinos, which, as we have said, had previously been examined. The watering-place was a small lake which was found to be muddy. 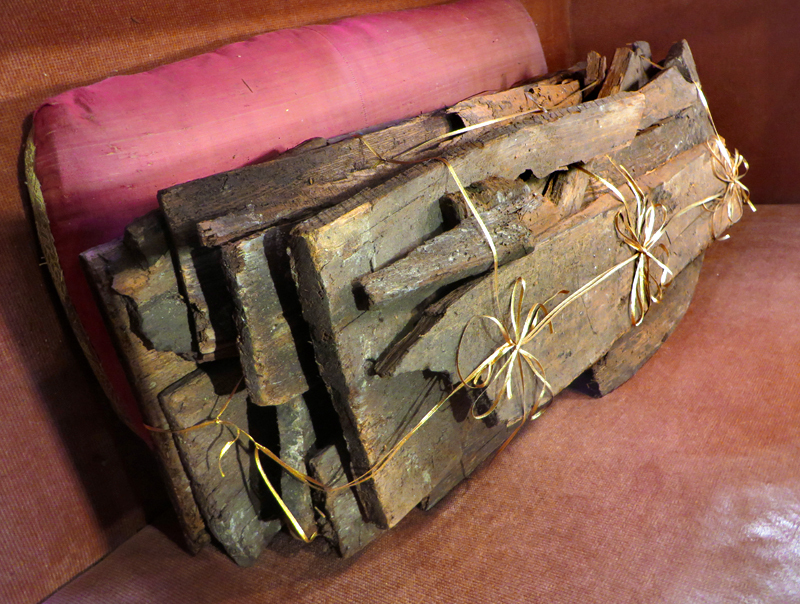 There was pasture and fire-wood in abundance. Here, when we came near the mountain range, we lost sight of the geese  a resource that had lasted up to this time. The day's march was five leagues. To the Punta de Pinos, 5 leagues. From the Estero de San Francisco, 46 leagues. We broke camp in the morning, and, keeping near the coast, began to ascend the hill of pines. The pine wood began before we reached the skirt of the hill. We passed to the other side of the hill where another bay lies sheltered to the north and northwest, as the point, extending from east-southeast to west-northwest, is a protection from those winds. This bay has, to the south, another point which protects it from the south and southwest. We cannot say that the anchorage protected by these points is good, as many flat stones and rocks can be seen in the water and on the shore. There is no beach, except on the eastern side, where an estuary of salt water enters. This receives the waters of a small river of considerable flow coming from a canyon that can be seen in the same direction. Nor can we say what the character of the bottom of this bay is, nor what its depth may be. We crossed the estuary, and camped at the edge of the water on the southern part of the bay, not far from a small stream of very good water. To the Ensenada de Pinos, 1 1/2 leagues. From the Estero de San Francisco, 47 1/2 leagues. To-day was taken to rest the men and animals, as they were very much in need of it. At this place, however, the men were much worse off than the animals, as the land had plenty of pasture for the latter, but lacked everything necessary for the former. The sea, which did not yield even a single shell-fish, was no less barren, although it abounded in sea-gulls and pelicans  the only fishermen on these shores  to which our people gave no truce, for they ate as many as they killed. The town and bay of Cadiz is situated under this parallel. The cold began to be felt intensely, and for two days the land wind from the north was very strong. As we were learning by experience, this wind usually blows without interruption for forty-eight hours, more or less. The coast, from the above mentioned point to the south of the bay, extends south by east. Ten scouts were sent out this morning. The captain of the presidio of the Californias, Don Fernando de Rivera, himself went with them, with six native pioneers. They carried a supply of tortillas to last for some days. Although a mule was killed to provide rations for the men, few ate of its meat except some European soldiers and the friendly Indians. We felt great apprehension about two mulatto muleteers who, having requested permission to go out hunting, had been absent from the camp for three days, and who had not yet appeared. We suspected that they had suffered some injury from the natives, or that they had deserted. The weather remained clear while the land wind continued, but in the afternoon of this day the wind changed to the south, bringing clouds and rain. The scouts arrived during the night tired out with the ruggedness of the mountain range, over which they had to travel on foot the greater part of the way, as far as their exploration took them. What they obtained from this inspection was to assure themselves that this mountain range was that of Santa Lucía  judging from the indications that they found coinciding with those mentioned in the sailing-directions of the pilot Cabrera Bueno. These signs are a high white rock jutting out somewhat from the coast  it can be seen for many leagues out to sea  and a headland in the shape of a trumpet which looks like a rocky islet, and is about six leagues from the Punta de Pinos. They reported that two of the six California Indians who had accompanied them had deserted. We did not know what to think of the situation. A port so famous as that of Monterey, so celebrated, and so talked of in its time, by energetic, skillful, and intelligent men, expert sailors who came expressly to reconnoiter these coasts by order of the monarch who at that time governed the Spains  is it possible to say that it has not been found after the most careful and earnest efforts, carried out at the cost of much toil and fatigue? Or, is it admissible to think that it has been filled up, or destroyed in the course of time? The accounts of General Sebastián Vizcaíno, and his contemporary historians, give the port of Monterey as being in 37° north latitude. We not only saw no signs of it, but not even the possibility that such a port had ever existed in that altitude, for there the coast is bordered by a range of very high hills terminating in the ocean, as the navigators may see. Now, then, we will say positively that the port of Monterey does not exist in the latitude (37°) indicated in the old sailing-directions; nor between 37° as far north as 37°44', in which, as we believe, lies the Punta de los Reyes. It happened that we found the port of San Francisco first, according to the signs, which, without the slightest variation (as far as we were able to see and judge) agreed with those given by the pilot Cabrera Bueno. And as this port of San Francisco, according to the pilot mentioned, and the others who have examined these coasts, lies to the north of Monterey, what hopes remain now that this port may be found farther north? Neither is this port south of the parallel of 37°, either in the Sierra de Santa Lucía, or out of it; for, having examined the whole coast, step by step, we have not the least fear that it may have escaped our diligence and search. We should say, moreover, that on the entire journey we have not seen lands more completely uninhabited than those situated in the latitude above mentioned, especially at the place where one emerges from the Sierra de Santa Lucía, nor have we seen a rougher or more savage people than its inhabitants. Where, then, is its numerous population upon which the old [voyagers] laid so much stress, and what of the extreme docility of its inhabitants? On the return [of the party] from the examination of the mountain range, our commander laid before his officers the unhappy plight in which we were placed  without provisions other than sixteen sacks of flour, without hope of finding the port and consequently of finding the ship which might aid us in maintaining ourselves in the country  and called them together in council. The council was to be held to-day, but it was postponed until to-morrow in order to give everyone more opportunity and time to consider such an important matter. There were some at the meeting who thought it best to remain at the Punta de Pinos until the provisions on hand should be entirely consumed, and finally to start upon the return march when these provisions were exhausted, submitting to the necessity of eating mule's meat for the rest of the journey. All these things, however, having been considered  in view of the few provisions that remained the excessive cold, and, above all, the snow that was beginning to cover the mountain range  our commander himself resolved upon the return, believing that if the passage over the mountains became impossible we should all perish. During the afternoon a violent south wind sprang up which caused a great tempest on the sea, and treated us very badly on land. The raw and tempestuous weather continued without permitting us to move from the place. The storm still continued, and the weather did not clear up until night. Before leaving this bay we erected a cross upon the beach with an inscription cut on the wood which said: "Dig! At the foot thou wilt find a writing." This writing is hereinafter transcribed word for word. "The land-expedition which set out from San Diego on July 14, 1769, under the command of the governor of California, Don Gaspar de Portolá, entered the Canal de Santa Bárbara on August 9; it passed the Punta de la Concepción on the 27th of the same month; and reached the foot of the Sierra de Santa Lucía on September 13; it entered this mountain range on the 17th of the same month; it completed the passage of the mountain range, going completely round it, on October 1; and on the same day came in sight of the Punta de Pinos. On the 7th of the same month, having already examined the Punta de Pinos, and the bays to the north and south of it, without finding any indications of the port of Monterey, it decided to go forward in search of the port. On October 30 the expedition came in sight of the Punta de los Reyes, and the seven Farallones of the port of San Francisco. The expedition endeavored to reach the Punta de los Reyes, but some immense estuaries, which extend inland an extraordinary distance, and which forced it to make a very wide circuit, and other difficulties (the greatest being the lack of provisions) made it necessary for the expedition to turn back, believing that the port of Monterey might possibly be found within the Sierra de Santa Lucía, and fearing that the port might have been passed without having been seen. The expedition turned back from the farthest point of the Estero de San Francisco on November 11; it passed the Punta de Año Nuevo on the 19th of the same month; and arrived again at this Punta and Ensenada de Pinos on the 27th of the same month. From that day to the present  December 9  the expedition was engaged in searching within the mountains for the port of Monterey, skirting the side towards the sea, in spite of its ruggedness  but in vain. Finally, now disappointed and despairing of finding the port, after so many endeavors, labors, and hardships, and without other provisions than fourteen sacks of flour, the expedition sets out to-day from this bay for San Diego. Pray thou Almighty God to guide it, and, sailor, may his Divine Providence take thee to a port of safety. "At this Ensenada de Pinos, on the 9th day of December, 1769. The commanders of the packets  whether the San Joseph or El Príncipe  are requested, that if within a few days after the date of the writing they should land on this shore, and inform themselves of its contents, and of the unhappy circumstances of the expedition, they should sail close to the shore, and follow it to San Diego, so that if the expedition should have the good fortune to catch sight of one of the two vessels, and should be able, by means of signals made by flags or gunshots, to indicate the place where the expedition may be, it might aid them with provisions, if that were possible. May God be glorified. We set out on the march, the weather being clear and cold. We proceeded for a league and a half, and pitched our camp on the other side of the Punta de Pinos. We travelled for a league and a half. To El Pinar, 1 1/2 leagues. From the Ensenada de Pinos, 1 1/2 leagues. We took the road to the northeast over the level country, as far as the river, which we forded. We pitched our camp somewhat above the ford, at the camping-place which we had occupied on September 30. Many geese were killed, with which we all satisfied our needs. The day's march was four leagues. To the Río Carmelo, 4 leagues. From the Ensenada de Pinos, 5 1/2 leagues. We broke camp and followed the canyon up the river. After a march of three leagues and a half we halted at the same place we occupied on September 29, called Los Cazadores. To Los Cazadores, 3 1/2 leagues. From the Ensenada de Pinos, 9 leagues. From Los Cazadores we made a day's march to the Real Blanco, a distance of three and a half leagues from that place. Many geese were killed, and we saw large herds of antelopes. To the Real Blanco, 3 leagues. From the Ensenada de Pinos, 12 leagues. We proceeded for four leagues as far as the Real del Alamo. Some natives were seen, and they offered us some atole made of acorns. To the Real del Alamo, 4 leagues. From the Ensenada de Pinos, 16 leagues. From the [Real del] Alamo we passed to the Real del Chocolate, a distance of four leagues from the former place. To the Real del Chocolate, 4 leagues. From the Ensenada de Pinos, 20 leagues. We left the canyon of the river, entering now the Sierra de Santa Lucía through another canyon, open from the northeast to the southwest. In this was situated the Ranchería del [Palo] Caído, which we found deserted. The day's march was four leagues. We halted near a very small watering-place, in which the animals could not drink. To the [Ranchería del] Palo Caído, 4 leagues. From the Ensenada de Pinos, 24 leagues. We travelled in the same direction, towards the southwest. On leaving the canyon which we had been following, we crossed another larger one, containing a stream of running water. We pitched our camp in the mountain range by the side of the Río de las Truchas, in the same place as on September 21. It was cruelly cold during the night and a heavy frost fell. To the Río de las Truchas, 2 leagues. From the Ensenada de Pinos, 26 leagues. This day's march was only one league, as far as the Real Angosto de los Piñones. The streams from the mountain range were already running as a result of the snow that had fallen during the early part of the month, so that we found water in abundance at this place. To the Real de los Piñones, 1 league. From the Ensenada de Pinos, 27 leagues. This day's march was difficult because of the greater ruggedness of the mountain range. It was also the stretch that had caused us the hardest work on our outward journey, because the greater part of the road had to be opened up by dint of pickaxe and crowbar. At this place we found the natives who had treated us so well the last time we passed, and they did no less on this occasion. To the Hoya de Santa Lucía, 2 leagues. From the Ensenada de Pinos, 29 leagues. The animals had become so worn out and exhausted that it was necessary to give them a rest. We now had but a very small quantity of provisions remaining and, since, for this reason, there had been some misconduct among the soldiers  different ones having had the audacity to steal the flour from the sacks  the commander decided to divide among them what remained, that each one should maintain himself from his own share. This was done, and all had an equal portion and were content. Each of the missionary fathers and the officers received a small quantity of biscuits and chocolate, with a ham to each for the remainder of the journey. In the morning we broke camp, and, following the road we had opened, we finally emerged from the mountain range. We descended to the beach which we followed for a distance of a league and a half. We halted near an Indian village, of which the inhabitants, advised of our arrival by the mountaineers, came out to welcome us. These Indians gave us to understand, by means of signs, that they had kept one of the deserters in their village where he had been resting for three days. We went there immediately and he did what he could to save us a part of the distance, for, as soon as he caught sight of us he came out to meet us; his feet were swollen, and he walked with difficulty. Asked what his motive was for deserting, he replied that his intention had never been to desert, but that he had gone out shooting geese along the coast, and his companion had proposed to him that they should follow the mountain range along the coast in order to be the first to discover the port of Monterey, and so gain the reward upon returning to the camp with the news; that they had walked all that day and the following one, as it appeared to them that upon discovering a point they would find the port behind it; that, having absented themselves for two days from the camp without permission, they felt sure that they would not be given any more severe punishment because of their being absent four or five days more without returning; and that if they should have the good fortune to discover the port, the offense would be excused, and, furthermore, they would receive the reward. And so they determined to continue their journey until they saw the end of the mountain range, which, with inexpressible toil and labor they succeeded in passing, at times even rolling down a hillside. Asked concerning his companion and the two Californian Indians who had also deserted, he replied that his companion on the trip was in a worse condition than himself, and that he had persuaded the Californian Indians to remain with him among some fishermen from the mountains, who lived together in a village at the beginning of the mountain range, until such time as he might be able to use his feet to continue the return to San Diego, where the speaker was also bound, not having the courage to cross the mountains again in search of us, both from fear of the punishment and from having a yet greater fear of the ruggedness of the mountain range. We travelled for three leagues on this day's march. To the Ranchería de Arriero, 3 leagues. From the Ensenada de Pinos, 32 leagues. The day broke very cloudy, for which reason it was not possible to continue the march. We broke camp in the morning, although it was threatening rain, but we had the good fortune not to have rain until we arrived at the place known as the Arroyo del Laurel; this name was given it because at this place we had seen the first of these trees. On this occasion we found, by the side of the stream, a small Indian village, the inhabitants of which gave us some of their pinoles and seeds. We pitched our camp on a low hill near this watering-place. It rained very heavily during the afternoon and night. We travelled for three leagues over a more direct road than that we had followed in coming. To the Arroyo del Laurel, 3 leagues. From the Ensenada de Pinos, 35 leagues. From the Arroyo del Laurel we went to the Real del Osito, which we had occupied on September 10, and which is three leagues from the former place. A passage, which on our outward journey we had opened over a cliff along the shore, had been washed out by the water, leaving it impassable. It was necessary for us to seek another passage, through a canyon covered with thickets, with our machetes in our hands. To the Real del Osito, 3 leagues. From the Ensenada de Pinos, 39 leagues. Before we set out from the Real de los Pinos more than two hundred natives of both sexes came to the camp. Many of them brought trays of pinole and some fish, with which we supplied ourselves, giving them glass beads in return, which have already become highly valued in these parts. To-day's march was three leagues and a half. We halted a little to the south of the Real del Estero, near a small village of Indian fishermen, from whom we bought a considerable quantity of fish, which somewhat relieved the people. In a short time a large number of natives came to the camp with trays of pinole and atole. To the Ranchería de los Indios Pescadores, 3 1/2 leagues. From the Ensenada de Pinos, 41 1/2 leagues. From the Ranchería de los Pescadores we passed on to the Cañada de los Osos and occupied the same place as on September 8. It was raining during the whole march, and we found the road very difficult. We travelled for four leagues. To the Cañada de los Osos, 4 leagues. From the Ensenada de Pinos, 45 1/2 leagues. We were very desirous of arriving at this canyon, having the intention of killing some bears, thinking that we would find as many as on the previous occasion. Preparations were made for the hunt very early in the morning; the soldiers took horses and led them by the bridle in order that they might saddle and mount them when necessary. On beginning the march, however, a very heavy rain set in and lasted. without stopping, all day and the following night. The animals were already loaded, and, as we were without provisions, it was not a time to lose a day's march. We therefore continued our march, ascending the canyon for a distance of three leagues until we arrived at a small stream, and on its bank we pitched our camp. There was plenty of fire-wood and pasture. To the Arroyo Corto, 3 leagues. From the Ensenada de Pinos, 48 1/2 leagues. As the men had been wet through, and kept awake, they rested at this place in order that they might fully dry their clothes. If, from the Cañada de los Osos, we had attempted to follow the same road as on our outward journey, there would have been not a few difficulties to overcome in traversing a spur of the range that extends into the sea. We found, however, that without making a circuit  even shortening the distance  we could avoid the mountain range by ascending the canyon, and that we would come out at the Plan de los Berros, or Ranchería del Buchon. We succeeded in doing this without any difficulty, the only bad passage that presented itself being that of a small stream, covered with rushes, which emptied itself between some low hills, forming a marsh of considerable extent; over this, however, we found a passage. The day's march was three leagues. As soon as the cacique Buchon knew of our arrival he came to visit us at the camp, bringing an abundance of pinole, atole, and very good tamales, which appeared to have been made of corn, and which, on account of our hunger, we found delicious. In return, we gave him some trinkets and glass beads, which he greatly valued, and sent him away. To the Ranchería del Buchon, 3 leagues. From the Ensenada de Pinos, 51 leagues. Before setting out from this place we received another visit from the cacique Buchon, who, without doubt knowing our necessity, brought a second present, larger and more abundant than that of yesterday. This was divided among the men, and from it each one drew a good portion. To-day's march, which we shortened by following the road along the beach, was two leagues and a half to the Laguna del Megano. We encountered no other difficulty than an estuary, the ford of which the Indians pointed out to us; we thus escaped the unavoidable circuits of the road inland, which is a labyrinth of ponds and estuaries. To the Laguna del Megano, 2 1/2 leagues. From the Ensenada de Pinos, 53 1/2 leagues. In the morning, some of the natives came to the camp bringing presents of pinole, atole, and tamales, which they sold to us in exchange for glass beads. We afterwards took the road to the Laguna Larga, a distance of three leagues. The natives of the surrounding villages came to the camp bringing presents like those we received at the Laguna Larga. To the Laguna Larga, 3 leagues. From the Ensenada de Pinos, 56 1/2 leagues. From the Valle de la Laguna Larga we marched to the Real del Baile de las Indias, a distance of three leagues from the former; now, however, we did not find the party of Indians, which had treated us so well the first time. Bears are to be met with in this district. On the way, the soldiers discovered among some thickets. a very large she-bear with three cubs following her. Horses were immediately saddled, and some of the soldiers went to give chase. They succeeded in killing the mother and one little cub, and with this provision there was a great feast in the camp. The meat of these animals has a very good flavor and taste, but at that time it seemed better than the best veal. To the Baile de las Indias, 3 leagues. From the Ensenada de Pinos, 59 1/2 leagues. From the Baile de las Indias we marched to the Cañada Seca, taking the precaution to carry some water from the Río de San Verardo, where we did not stop because this is a place without fire-wood; the distance is three leagues. To the Cañada Seca, 3 leagues. From the Ensenada de Pinos, 62 1/2 leagues. Early in the morning, some natives from the Río de San Verardo came to the camp bringing some provision of pinole and atole. We then moved our camp to the Punta de los Pedernales, a distance of two leagues. From the Punta de los Pedernales, the Punta de la Concepción  the most westerly point of the Canal de Santa Bárbara  can be seen to the southeast, 8° east; the most westerly point of the Isla de San Verardo, to the south, 33° east; the westerly point of the Isla de Santa Cruz, directly to the southeast. To the Punta de los Pedernales, 2 leagues. From the Ensenada de Pinos, 64 leagues. We left Los Pedernales. We passed the Ranchería de la Espada without stopping, and arrived at the Pueblo del Temí or Cacique Cojo, a distance of four and a half leagues from the former place. The Indians of the town gave us a quantity of fresh and dried fish, many sardines, and bonitos, so that, thanks to God, we begin to see abundance in the camp. For another thing, the country, covered with beautiful green grass, offered excellent pasture for the horses, so that we had the satisfaction of seeing them grow appreciably stronger every day. The weather, from the time we left the Cañada de los Osos, had been very clear. Only the nights were cold; the days were more like those of spring than of winter. POSITIONS OF THE ISLANDS FROM THIS PLACE. The island of San Bernardo, in the language of the natives, is called Thoa; that of Santa Cruz is called Lotolic; that of Santa Bárbara, Anajup. To the Pueblo del Cojo, 4 1/2 leagues. From the Ensenada de Pinos, 68 1/2 leagues. In the morning, we left the Pueblo del Cojo or Punta de la Concepción. We travelled for two leagues to the east, and halted near the town which was given the name of San Zeferino Papa. There was enough fish in this village for all the men. At sunset, with the same compass, the center of the sun was ascertained to be west, 36° southwest; its declination was 22°32' at that hour, with a slight difference. The altitude or latitude of the place, by observation made on August 25, is 34°30', and, consequently the western amplitude of the sun would be 27°42'; this being subtracted from the magnetic amplitude gives the variation of the compass on these coasts of 8°18'. To San Zeferino, 2 leagues. From the Ensenada de Pinos, 70 1/2 leagues. From San Zeferino Papa it is two short leagues to San Luis Rey. We covered the distance before noon and halted at the same place as on the former occasion. To San Luis, 2 leagues. From the Ensenada de Pinos, 72 1/2 leagues. From San Luis Rey we passed to the town of San Guido, a distance of two short leagues over a bad road; this was covered in the morning. To San Guido, 2 leagues. From the Ensenada de Pinos, 76 leagues. In the morning, we moved our camp from San Guido to San Luis Obispo, a distance of three short leagues from the former place. To San Luis Obispo, 3 leagues. From the Ensenada de Pinos, 79 1/2 leagues. From San Luis Obispo we went to the the Pueblos de la Isla, a distance of two leagues and a half, over a somewhat difficult road and through a country covered with live-oaks and other trees. We halted to the east of these towns in a clear and open place. To the Pueblos de la Isla, 2 leagues. From the Ensenada de Pinos, 87 1/2 leagues. We set out from the Pueblos de la Isla, desirous of reaching the Pueblo de la Carpintería, five leagues and a half distant, with the purpose of leaving behind all the obstructions along the channel while the ground was dried by sun and wind. We passed through the Pueblo de la Laguna without stopping, and arrived quite late at the Pueblo de la Carpintería, near which we occupied the same camping-place as on August 17, when on our way up the country. There was no fish either in this town or in the Pueblo de la Laguna; it may be that the Indians have not applied themselves to fishing, or that this coast is without fish at this season. To the Pueblo de la Carpintería, 5 leagues. From the Ensenada de Pinos, 86 1/2 leagues. From La Carpintería we passed to La Asumpta, the last town on the channel. We passed through the Pueblo del Bailarín without stopping. All these towns, which on our outward journey had plenty of fish and furnished us with much of it, were now without any, and we saw that they were in great need, so that, had we not made some provision at the towns behind, we should all have been badly off. This day's march was five leagues. From this place the most westerly islands of the channel could no longer be seen. That of Santa Bárbara was the only one observed. Note: Las Mesitas are small islands of moderate elevation above the sea, and level on top, to the west of La Falsa Vela, another islet of greater elevation, which, the first time we saw it, appeared to us to be a vessel. To La Asumpta, 5 leagues. From the Ensenada de Pinos, 91 1/2 leagues. Upon leaving the Canal de Santa Bárbara we entered the Cañada de Santa Clara, through which we passed in a southeasterly direction in order to enter the Sierra de la Conversión, it being our intention to reach the Cañada de los Robles or Encinos, otherwise called Santa Catalina. It appeared to us that we must pass over the mountain range through an opening that we saw in the same direction. We forded the Río de Santa Clara and took a guide from the Indian village which is near its banks, close to which we had encamped on August 13. We followed a low ridge and descended to a plain of considerable extent which, on its western side, terminated in the sea, while, to the east, it extended to some other low hills which we ascended. We afterwards entered a very large canyon trending to the southeast, which we followed. We halted near an Indian village containing somewhat more or less than sixty people, very poor and thin. At this place there was sufficient water, fire-wood, and pasture. The day's march was six leagues. To the Sierra de la Conversión, 6 leagues. From the Ensenada de Pinos, 97 1/2 leagues. We took a guide from this village who led us through an opening that was very easy of passage, by which we crossed a large part of the mountain range. We afterwards ascended a slope down which a stream ran; its source was a very large spring, covered with watercress. Having ascended this slope we found ourselves on level ground in another very beautiful canyon, covered with grass and live-oaks. This canyon ended in another slope, somewhat difficult of passage, and at the foot of it there was a small Indian village where the inhabitants gave us roasted mescales in exchange for glass beads. All this country has beautiful scenery and plenty of water. We ascended the slope and from its summit we saw another very beautiful plain on which there was another Indian village near which we halted. Close by there was much water, and fire-wood, and an abundance of pasture for the animals. The day's march was two leagues and a half. Through the same mountain range, 2 leagues. From the Ensenada de Pinos, 99 1/2 leagues. Two of the oldest natives of the town offered to serve us as guides to lead us out of the mountain range. In setting out they took a course to the southeast which was the direction that best suited us, it being the shortest way. After travelling half a league or a little more from the camp, they began, however, to lead us through the most rugged and intricate part of the range. We found out, although late, that we could not pass through those brambles with the pack-animals. We then turned back, and, passing near their village, took other guides who led us over a better road following, it is true, an entirely different direction, which was to the northeast. They led us over some accessible low hills and, after leaving them behind, we reached level country to the east. At a distance of two short leagues, we halted near a small village; the inhabitants insisted that we remain with them, [saying] that we should not pass on, as the watering-place was far off and as it was now too late to reach it before sunset. We were not disappointed in stopping at this place which was called El Triunfo. It is a plain of great beauty and extent, overgrown on all sides with live-oaks and white oaks, and having much pasture and water. To El Triunfo, 2 leagues. From the Ensenada de Pinos, 101 1/2 leagues. We took guides at El Triunfo [to lead us] as far as another small village, a league and a half distant. At this village they gave us other guides who, leading us to the northeast, caused us great uneasiness. In spite of all the signs we made to them to lead us east or southeast they, however, persisted in refusing, telling us that the country was impassable in those directions, and we had no reason to regret having believed them. A short time afterwards, they turned to the east, ascending a long but gradual slope. From its summit we discovered what we were looking for, that is, the Valle de los Robles or Santa Catalina. We descended to it and, travelling to the southeast, arrived late at our old camping-place at the Real de los Robles which we had occupied on August 5 and 6. To-day's march was six leagues and a half. To the Real de los Robles, 6 leagues. From the Ensenada de Pinos, 107 1/2 leagues. We now proceeded with a better knowledge of the country and, knowing where we were going, we discussed the direction we had to follow with greater certainty; besides this, the mountains furnished us points and determined places which served as landmarks to ascertain our position. Thus we greatly shortened our road. From Los Robles, without leaving the same valley, we continued to the southeast, and, instead of passing in an easterly direction over the mountain range which borders it, and over the road we followed on our outward journey, we cut across the mountain range in a southeasterly direction without losing any ground. Fortune also aided us, allowing us to find a gorge which permitted our passage without difficulty to the plain of the Ojo de Agua de los Alisos. We were now free of all the obstructions of the mountains, as from this point the country is level as far as San Diego. We made three leagues and a half on this day's march and halted among some low hills on the edge of the mountain range, a little way from a stream which sinks into the sand not far from its source. To the plain of the Ojo de Agua de los Alisos, 3 1/2 leagues. From the Ensenada de Pinos, 111 leagues. On entering the plain we saw towards the east a chain of mountains covered with snow, which we had also seen on entering the Cañada de Santa Clara. From the low hills which we were leaving we likewise saw the Río de la Porciúncula or, at least, the fringe of trees lining its banks. Hence it was only necessary to direct our course towards it, crossing the plain towards the southeast. We reached the river and forded it; observing from the sand, rubbish, fallen trees, and pools on both sides that there had been, a few days before, a great freshet which had caused it to overflow its banks. We proceeded for three leagues more, as far as the Valle de San Miguel, and halted there in the same place we had occupied on July 30. To the Valle de San Miguel, 5 leagues. From the Ensenada de Pinos, 116 leagues. We set out through the mouth of the Valle de San Miguel which is very thickly wooded. For a long time we continued to the southwest following the river which, rising in a large spring in the same opening, merits the name we gave it. Its banks are covered with willows and some small poplars. We forded the river and reached level ground, travelling to the southeast as far as the Río de los Temblores; this we likewise forded. It carried more water than the Porciúncula. We covered six long leagues on this day's march. To the Río de los Temblores, 6 leagues. From the Ensenada de Pinos, 122 leagues. From the Río de los Temblores we went to the Aguage del Padre Gómez. The whole way is over level country. This place has little fire-wood. The day's march was four leagues. To the Aguage del Padre Gómez, 4 leagues. From the Ensenada de Pinos, 126 leagues. From the Aguage del Padre Gómez the road is hilly as far as San Francisco Solano, a distance of three leagues. At this place there is a stream which carried a great deal of water when we passed it on July 24; we marvelled greatly on seeing it now completely dry, after there had been so much rain in the whole district. This we attributed to the fact that the stream must receive the water of the snows from some of the snow-capped mountains we saw inland; it probably does not flow except when the snow melts. As there was no object in remaining in sight of this, we continued for two leagues farther until we reached the canyon called Cañada del Incendio or Cañada de Santa María Magdalena. The stream in this canyon had also dried up, but pools remained in which there was sufficient water for the men and horses. During the night some of the soldiers who were sick with diarrhea and tenesmus became seriously ill. There is plenty of fire-wood in this place. To Santa María Magdalena, 5 leagues. From the Ensenada de Pinos, 131 leagues. From Santa María Magdalena or Cañada del Incendio we went to the Cañada del Bautismo. We found the watering-place dried up and we had to go farther in search of water. We found it in a stream within a canyon, a little more than a league from the Cañada del Bautismo. There was enough pasture and fire-wood. March to the water, 4 leagues. From the Ensenada de Pinos, 135 leagues. We passed through Los Rosales and the Cañada de Santa Margarita, without stopping until we reached the Valle de San Juan Capistrano. It was a march of six leagues over low-lying hills. We saw in the canyons that end in the valley various ponds which we had not seen on passing in July of last year; these were formed by the rains that had fallen in the intervening period. To the Valle de San Juan Capistrano, 6 leagues. From the Ensenada de Pinos, 141 leagues. From San Juan Capistrano we went to San Jacome de la Marca, a day's march of seven leagues, which was equal to three of those we made when coming: the distances of the latter are, from San Juan to Santa Sinforosa, two leagues; to San Alejos, two more; and three leagues to San Jacome. To San Jacome, 7 leagues. From the Ensenada de Pinos, 148 leagues. We were nearing San Diego and varied were the opinions among us about the condition in which we should find the new settlement that we had left at its very beginning, more than six months ago. Each one discussed the matter according to his temperament and the mood affecting him. Some, seeing things in a favorable light, expected to find there every comfort and help; others grieved, considering its weak state and the few resources we had left it. In truth, all of us were returning with a misgiving lest, through the continued force of the maladies, and the mortality among the people, the settlement had become a place of solitude. On the other hand, there was every reason to fear the evil disposition of the natives of San Diego, whose greediness to rob can only be restrained by superior power and authority, and we feared lest they had dared to commit some outrage against the mission and its small garrison. As we had obtained no news whatever along the coast concerning the ships, notwithstanding our efforts in that direction, we had fears in anticipation that in San Diego we should meet with a like disappointment. While we were still engaged with these thoughts and discussions, which for days had been wearying us, we received an unexpected pleasure at the sight of fresh tracks of men and horses, at more than half a league from the presidio which we saw soon afterwards. As soon as we saw the palisade inclosure and the humble buildings which it contained, we gave a salute, discharging our arms  the first announcement to its occupants of our arrival. They immediately came out with the greatest joy to receive us in their arms. We found the missionary fathers, Fray Junípero Serra, president of the missions, Fray Juan Viscaíno, and Fray Fernando Parron, in good health; the first and the last mentioned were still convalescing from the common sickness of scurvy which, even now, afflicted various soldiers  the veterans we had left behind as well as those of the presidio  and christianized Californian Indians. We learned from them how that, a few weeks after our departure, God had taken to Himself all those we had left sick in their beds; but that, through the charitable and tireless devotion of the surgeon, Don Pedro Prat, those in whom the disease had not taken such a firm hold during the sea-voyage, had recovered. We also learned that those who had subsequently fallen sick, which included everyone, as the disease spared none, had been restored to health. Experience thus proved, in this instance, how opportune was the wise decision of him who sent a man of this profession and of such commendable ability [with the expedition], and how useful such persons are in any colony or new settlement. They likewise told us that, on August 15, the Indians of the villages nearest the camp, influenced solely by their cupidity and desire to rob, took advantage of a favorable opportunity to throw themselves upon the camp with the intention of robbing it, and of carrying away what they could; that upon meeting with some resistance from the few people who were at the time in camp  as the larger part of the garrison was away  they attempted to use violence, having recourse to their weapons; that, at the first discharge of their arrows, they killed a muleteer and wounded the reverend father Fray Juan Vizcaíno; that our men who were in a condition to take up arms fired at them, killing three of the natives and wounding several, and obliging them to retire with this punishment. From that time, however, the natives had not ceased to cause some damage, and had killed some horses and wounded others with arrows, but they did this at night and without being seen. Port and Presidio of San Diego, February 7, 1770. 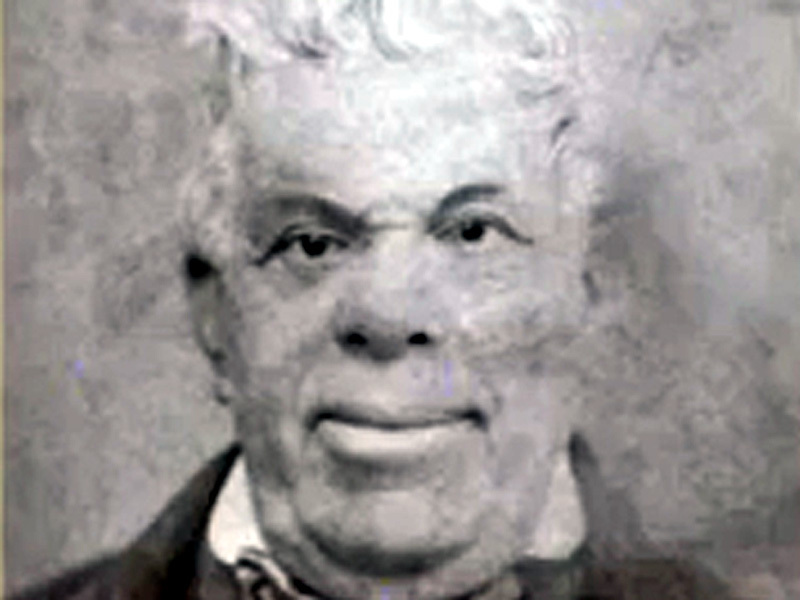 Miguel Costansó. I certify that this is an exact copy of the original which is in the Secretaría de Cámara of this viceroyalty which is in my charge. Mexico, June 20, 1770. Don Francisco Xavier Machado Fiesco.